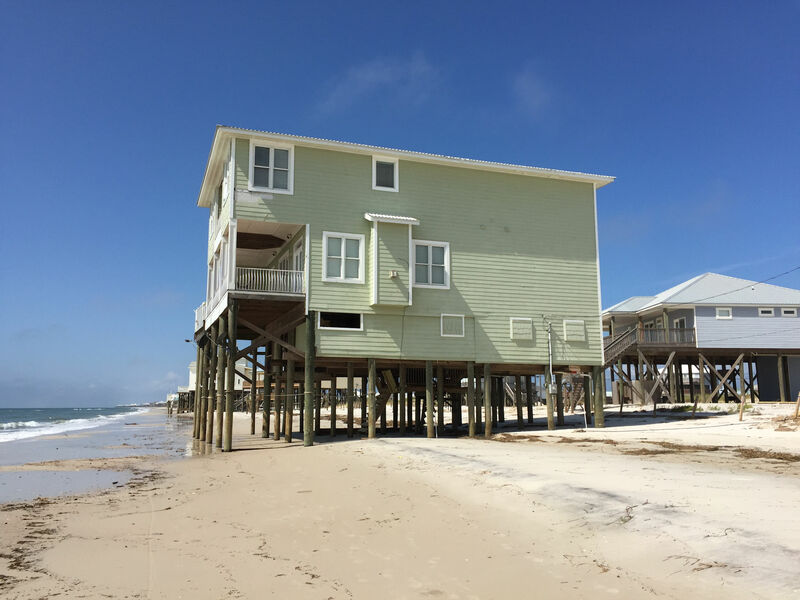 A public meeting to offer interested stakeholders an opportunity to ask questions about the various tasks associated with the Alabama Barrier Island Restoration Assessment (ABIRA) is set for Monday, December 11, 2017 at 6:00 p.m. at the Dauphin Island Sea Lab Shelby Auditorium, 101 Bienville Blvd., Dauphin Island, Alabama. 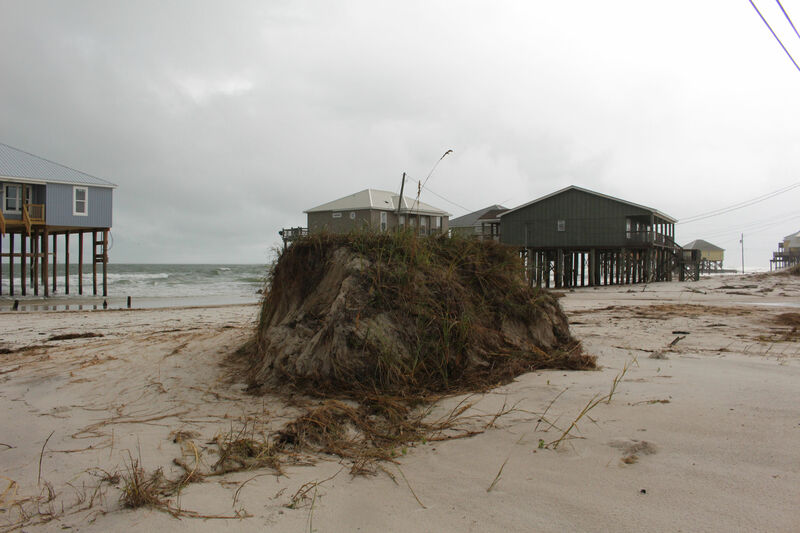 This project is a collaborative effort between the U.S. Geological Survey (USGS), U.S. Army Corps of Engineers (USACE), and the State of Alabama funded by the National Fish and Wildlife Foundation (NFWF) to investigate viable, sustainable restoration options to protect and restore the natural resources of Dauphin Island, Alabama. 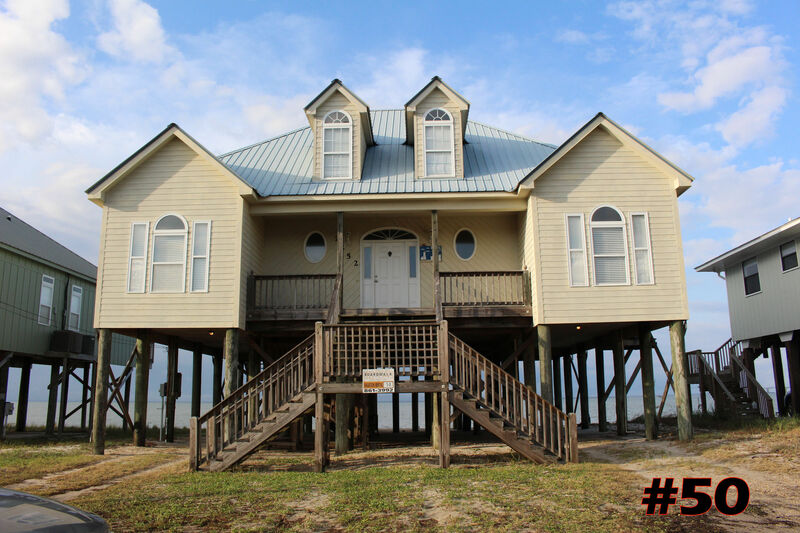 The study is focused on restoration options that protect and restore habitat and living coastal and marine resources, as well as protect the coastal resources of the Mississippi Sound/Mobile Bay and the southern portion of Mobile County including the expansive Heron Bay wetlands. 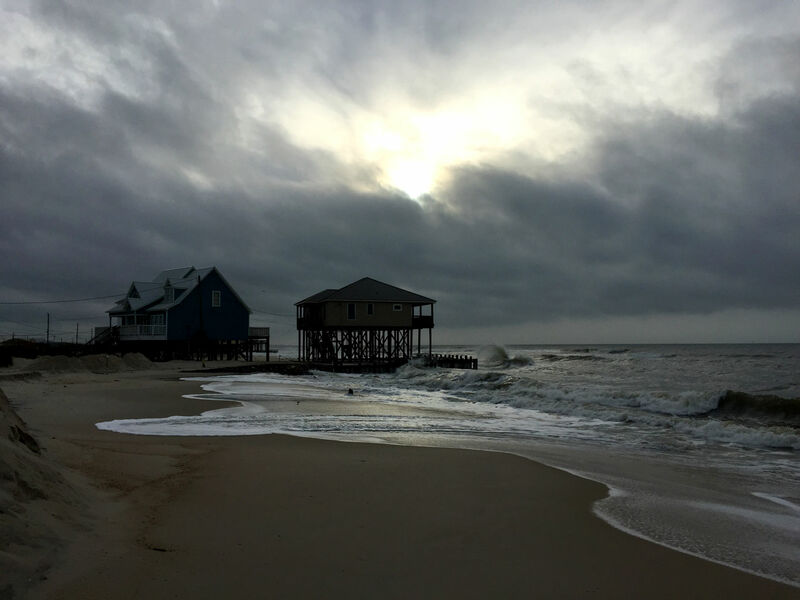 Data collection and modeling will be used to evaluate restoration actions with regards to resiliency and sustainability in support of critical habitats and resources. Two reports will be prepared as part of this technical assessment - an Interim Report and a Comprehensive Report - documenting the combined efforts of the feasibility study. In addition to providing a status of project activities to date, the Interim Report includes a review of potential restoration projects and the likely benefits associated with implementing those types of projects that would add to the value of the resources of the island and adjacent waters while at the same time not precluding subsequent projects to be discussed in the Comprehensive Report. The Comprehensive Report, due to be released in early Spring 2019, will include the methodology applied, data collected and analyzed, models applied and their results, detailed description of all alternatives evaluated, and the impact and benefit of each alternative towards preserving and enhancing the ecological functions and values of the island and the associated estuarine resources the island helps to maintain. 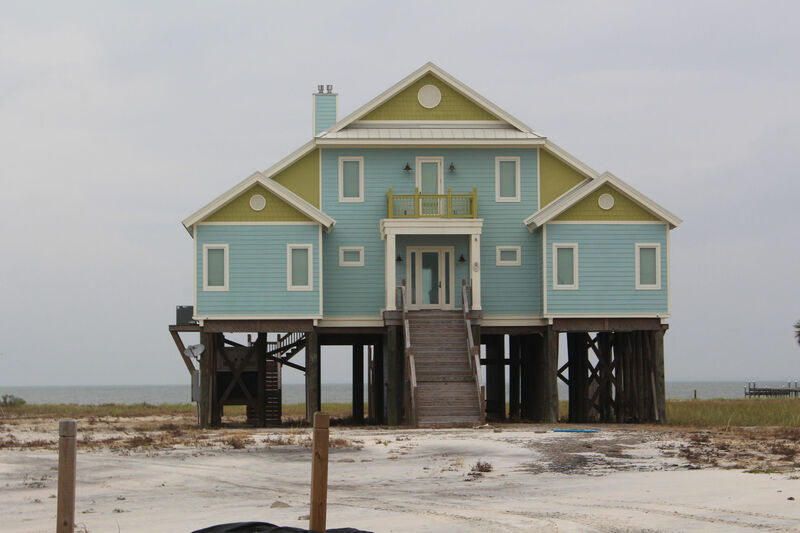 It will also include a decision tool and matrix to provide decision-makers with information on the benefits and tradeoffs for different restoration alternatives, including the long-term restoration and protection of the habitats and resources affected by the Deepwater Horizon oil spill. 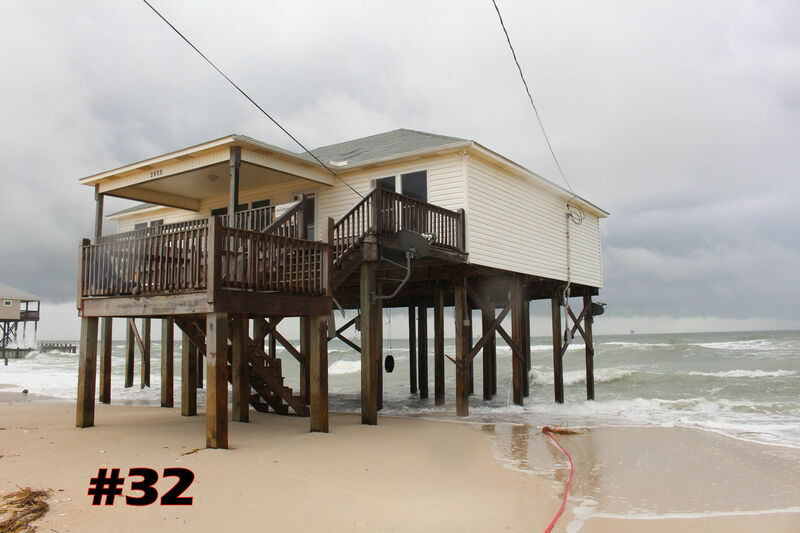 The Interim Report is available on the ABIRA website and can be viewed by clicking on the following link: https://gom.usgs.gov/DauphinIsland/Reports.aspx. 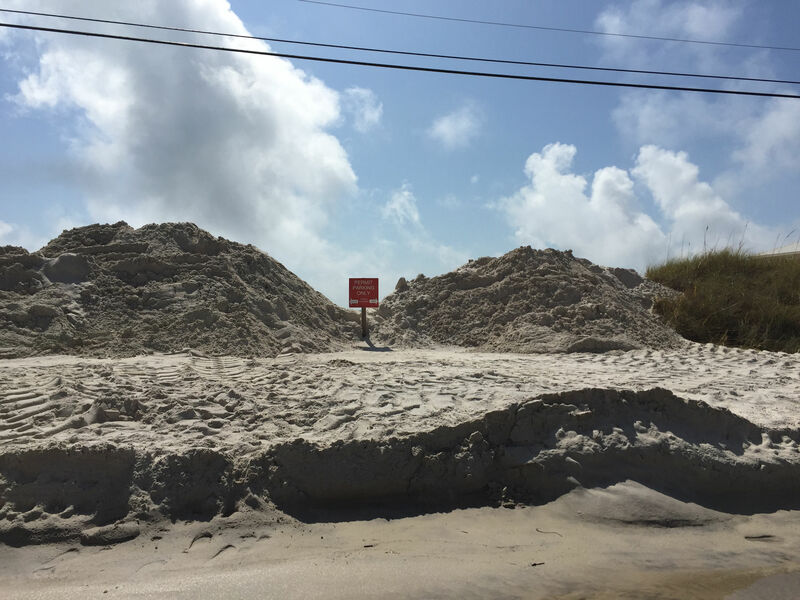 FEMA funds have been approved to help our Island return beach sand that was washed from the beachfront onto the rights of ways and streets back to the beachfront. 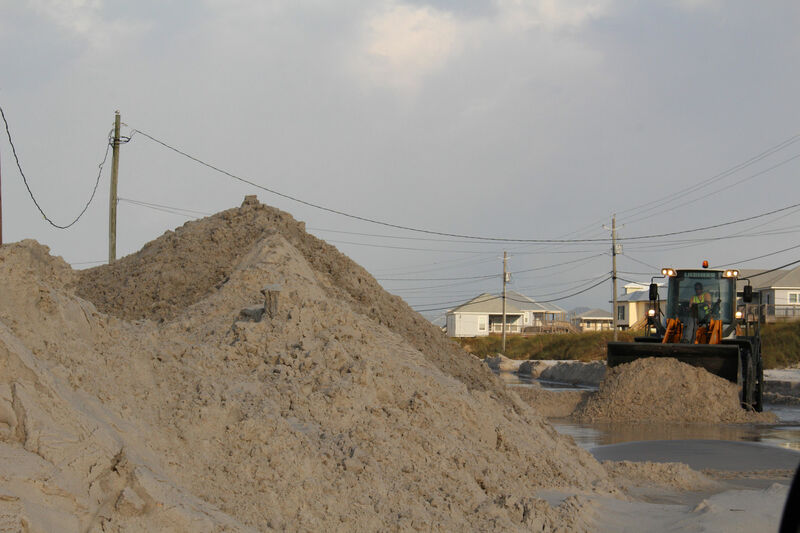 Over the next few weeks sand will be picked up from the sand piles created when our roads were cleared of sand, sifted and deposited back along the waterfront. The process is interesting to watch and is vital to protect our delicate beach environment. 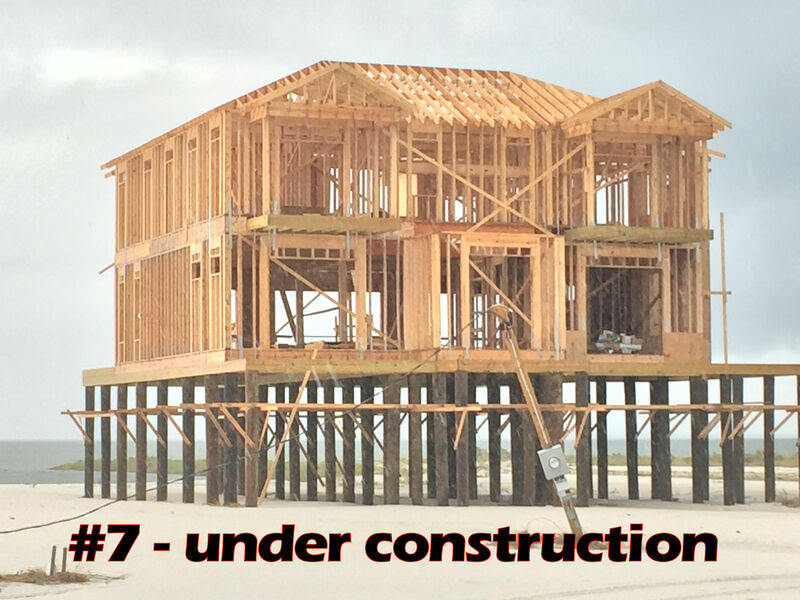 While in progress expect to see heavy equipment moving along various stretches of beach, locations of work will vary as work moves along the coastline. No work will take place in the evening or nighttime hours or on Sundays. Thanks for your continued support for the Island as we wrap up these final remnants of Hurricane Nate. St Edmund's Church is hosting it's Fall Bazaar Saturday November 11 from 8am to 2pm. The Ladies of St Edmund's will also be selling baked goods, gumbo, chicken salad and more. Yum! To find all the Island Wide Yard Sale locations a map will be available at the Bazaar with addresses so you can shop til you drop! The 2nd Annual Tri the Gulf Triathlon is set for Saturday, October 21 from 7am-10am. The race course will involve numerous roads (ex. Orleans Drive, Hernando, Indian Place, Iberville Drive, Bienville Blvd., Lemoyne Drive, etc.) and the DI Bridge (the bridge will be limited to escorted one way traffic) during this time frame. Please plan your travels accordingly. Boil Water Alerts have been lifted for all areas on the west end currently receiving service. DIW&S continues to work to restore service on the south side of Bienville Blvd. from Seneca Street west. Please contact the W&S office for more info. Sand removal contractor is currently working to clear piles of sand blocking private driveways. That work will continue until all homes have access. 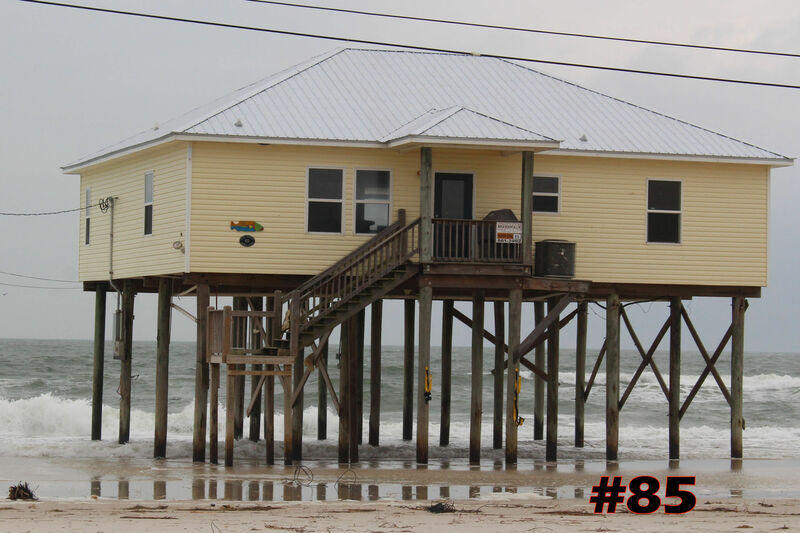 Otherwise, sand will not be returned to the south shoreline until EMA/FEMA give us the green light to do so. The checkpoint will remain in place for now. 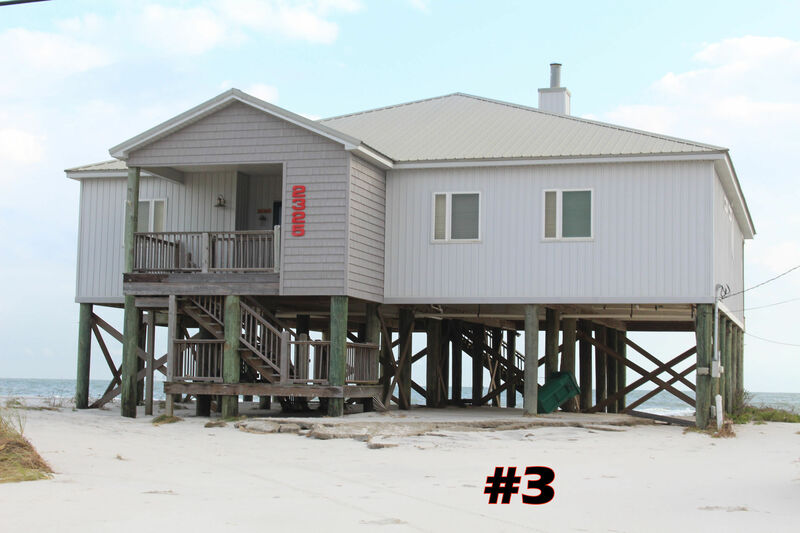 The 3rd Annual Dauphin Island Art Trail takes place this Saturday October 14th from 9-4. Come enjoy work from over 50 local and regional artists including Joe Sheffield, Dena McKee, Kathy Jones, Stig Marcussen, Sue Cox,Eliza Coral, Audie Stanfill Jr, Freddie Blache, Jimmy Stroud & More. Pick up a map at any of the 10 art stops and get it stamped to win prizes. 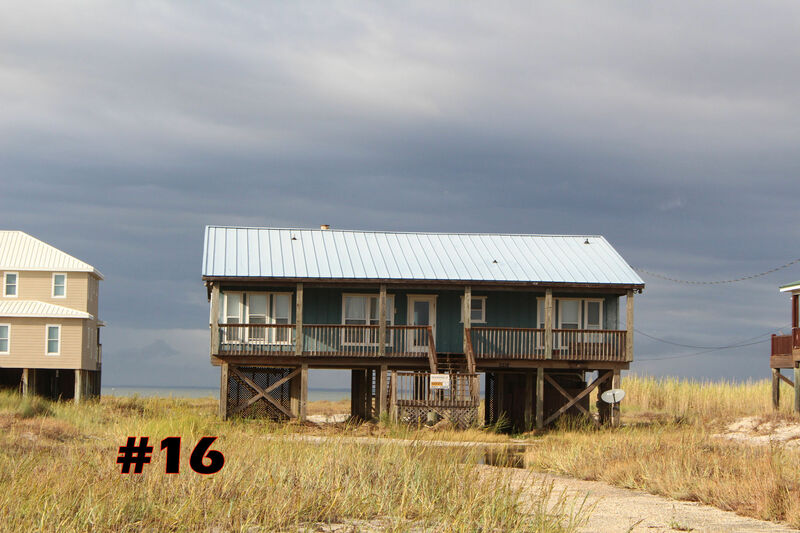 Art stop locations include: Blu Revival Surf Shop, The Sand Box,The Estuarium, Fort Gaines, The Happy Octopus, The HIppie Fish, Mac 'N DDs Emporium, Ship N Shore and The Silver Pearl. Come join the fun! The last Sunday Sunset Concert of the year will be relocated from the West End Beach to Fort Gaines. The concert is set for Sunday October 15th at 4:30pm and features Roman Street. Admission is $5 per person (age 13 and over). Bring seating and bug spray. No pets, glass or grills. BIG THANKS to the road crews who are working around 24 hours a day to clear sand from the roadways! As of this afternoon Ryan Court, St Andrews Court, and part of St Denis Court have been cleared. Crews hit a bit of a snag on St Andrews Court today when a bulldozer damaged the water line. Crews are working now to repair the water service to St Andrews and should have it restored shortly. On the far West end crews have cleared the following streets: Seneca, Serigny, Shell, Slidell and Spanish. Bienville has been cleared its full length and both lanes are now usable. 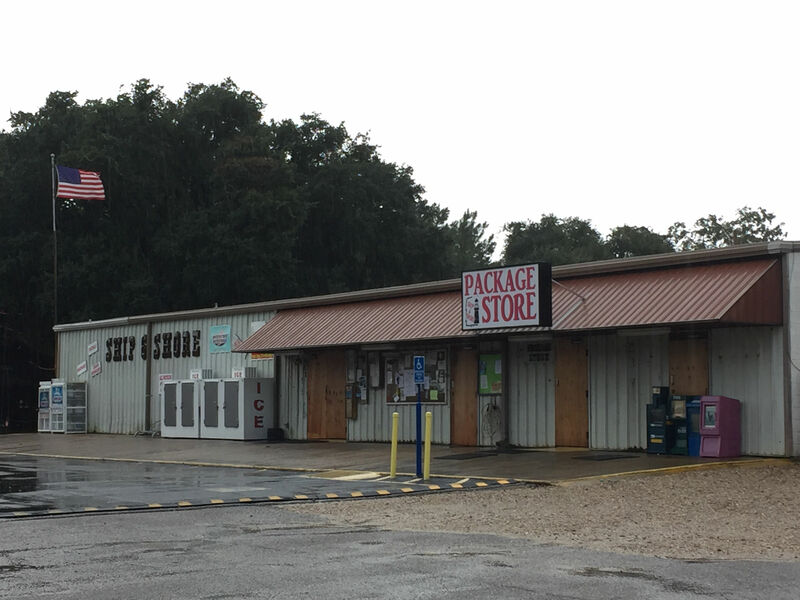 West End Update: Bienville Blvd. 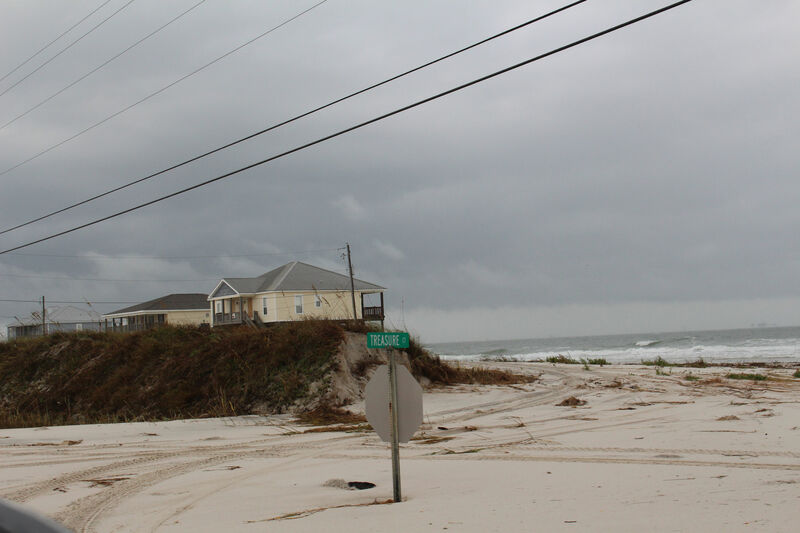 is in good shape (little sand & water remaining on road) all the way to the West End Beach (which remains closed) while sand removal now shifts to the 30+ side streets. Check Point remains in place at Rapheal Semmes. Homes currently receiving water service are no longer under a Boil Water alert. However, those currently without water service will likely need to boil water when first connected---CHECK with Water & Sewer for additional details and information. Progress is being made on ALL fronts! Thank you for your patience. 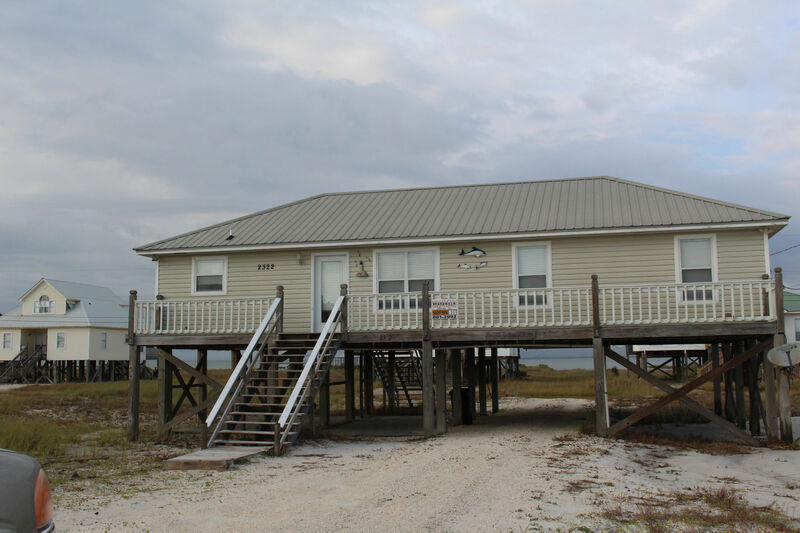 Access to the West End region of Dauphin Island by licensed contractors is by PERMIT ONLY in pre-approved areas as determined by the Town of Dauphin Island. Permits will be issued through Town Hall (as usual) for all work and permit must be presented at Check Point for access. 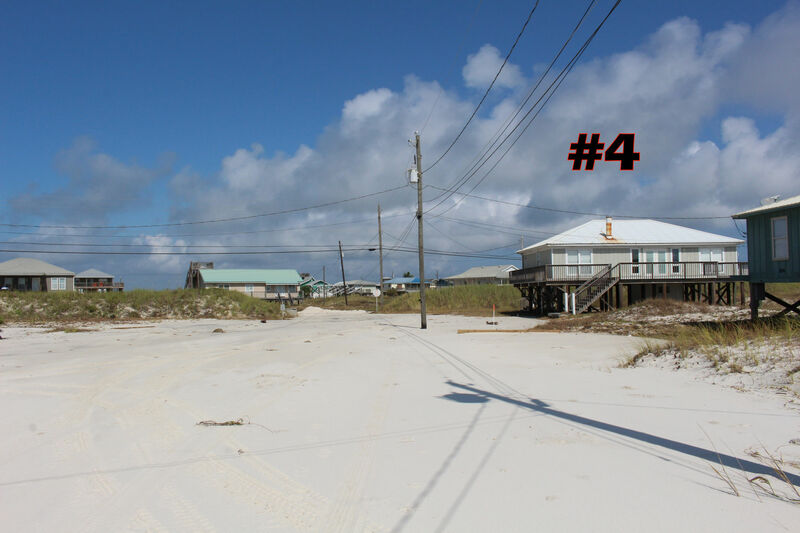 If sand is to be moved from within town right-of-way to afford access to private homes, improve driveways, etc. ALL sand must remain within the right-of-way! Contractors are strongly reminded NOT to perform work on any property without a permit as significant fines will be imposed on violators on the first offense. Information will be available at town hall regarding the extent of access where permits will be issued. This will be determined in conjunction with the progress of clearing Bienville Blvd. 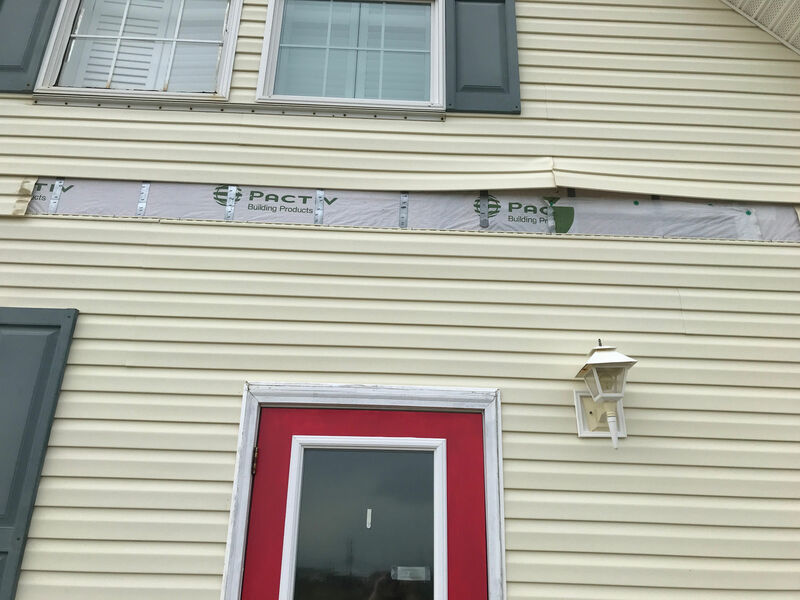 Note: You may want to contact the homeowner and/or their Insurance Company before performing any work to avoid potential loss of claim. If you have any questions you are encouraged to contact town hall (861-5525 ext. 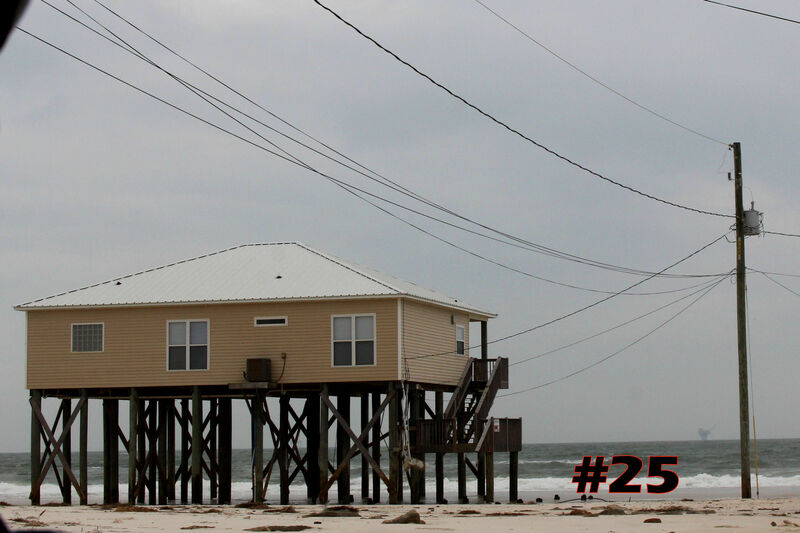 222) or Building Inspector Corey Moore (234-7466). We greatly appreciate your cooperation in this matter as we work to recovery from Hurricane Nate. 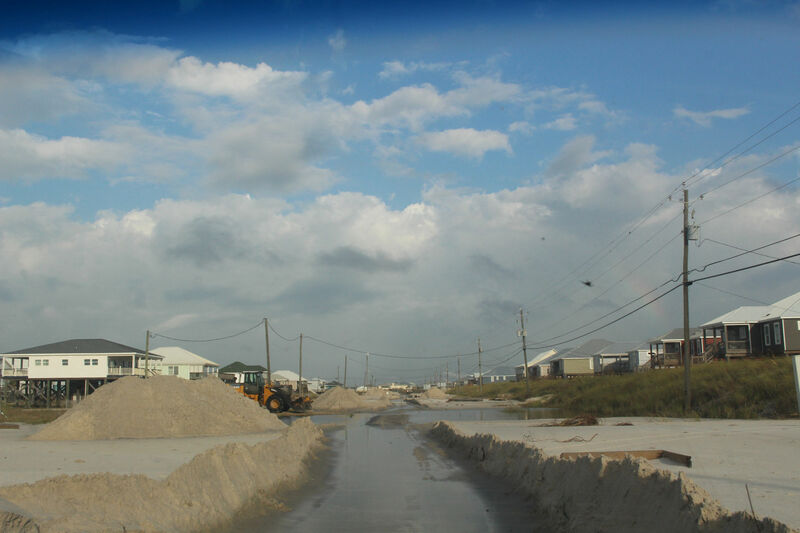 QUICK UPDATE FROM THE MAYOR: Contractors clearing sand from Bienville Blvd. are nearing the west end of the road (West End Beach) at the time of this post! Sand removal will shift to side streets first thing Thursday morning. DIW&S officials report water is on up to (but not including) Seneca Court on the south side of Bienville and to and including Sehoy on the north side of Bienville AND also Bridgeview Drive. These areas remain under a BOIL WATER ALERT until further notice. 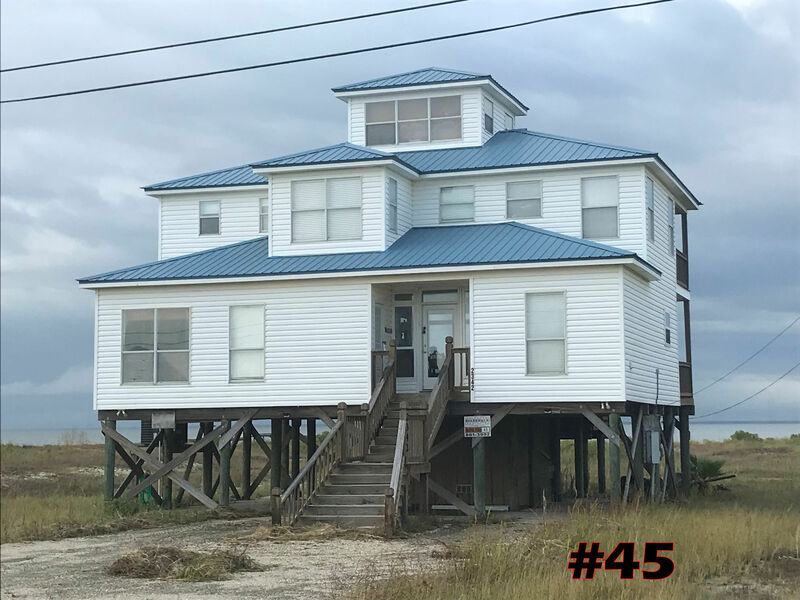 Boardwalk Realty vacation property owners and sales customers please remember you must have a current re-entry pass to proceed past the check point at Raphael Semmes Ct. If your pass has expired and you plan to come down in the near future and need a pass, let our office know and we can pick up passes for you from Town Hall during their business hours. We can then make arrangements to pick up your passes from our office 24/7. The road crews are doing a great job on Bienville Blvd with progress being made today almost to SeHoy. 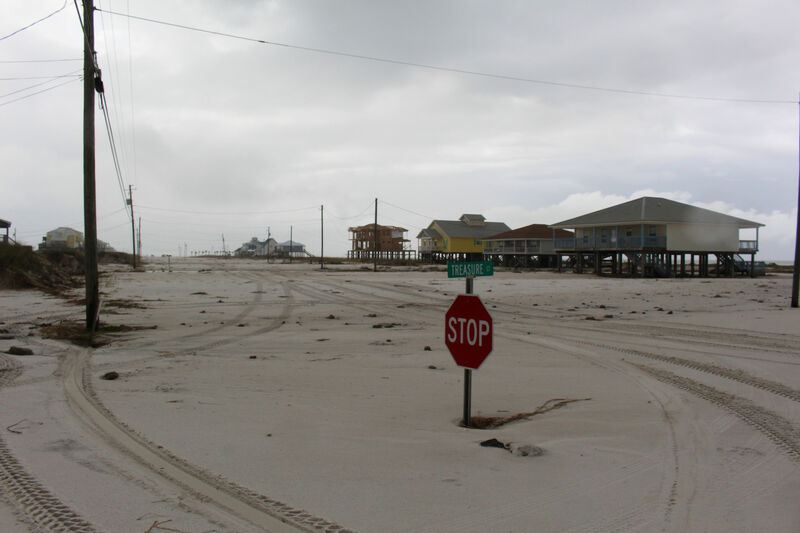 While Bienville is clear of sand, it is not an easy drive. 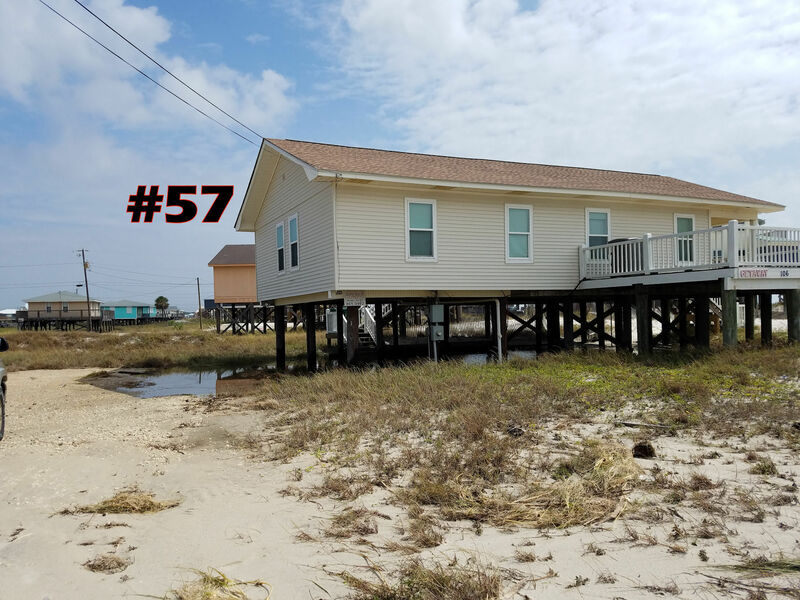 There is still some water in the roadway and Bienville is cleared as a narrow channel with sand piled on either side so there is no way to the homes without a 4 wheel drive and even then the piles are too high in place for the 4 wheel drives. Boil water order reamins in effect on the south side of Bienville from St Denis Ct west and on the north side of Bienville from St Stephens west. Power has been restored in the 2300 block although there may still be some outages at specific properties. DI Water and Sewer is working to restore water service to the west end and we hope to have more updates regarding utility services tomorrow. Below is today's update from Mayor Collier. Substantial progress was made overnight and today clearing sand from Bienville Blvd. As of now, the contractor has reached Sehoy Street! This will provide easier access to this portion of the island by property owners, utility repair personnel and emergency response vehicles. We remain hopeful work crews will complete Bienville Blvd. by week's end. At that point, focus will then shift to the side streets south of Bienville. The more lengthy process will include the screening and transporting of sand back to the south shoreline. In the meantime, the Check Point will remain in place and you will need a 4-wheel drive vehicle for many areas west of Raphael Semmes. Contractors will need to stop by town hall in advance to secure work permits for repairs beyond the Check Point. Insurance adjusters should also check in at town hall to receive a placard for entry to the west end. Don't forget that town dumpsters are available for hurricane debris ONLY today thru Thursday during regular business hours. Dumpsters will be open as usual on Friday & Saturday. If you need any additional information please don't hesitate to contact town hall (or me). 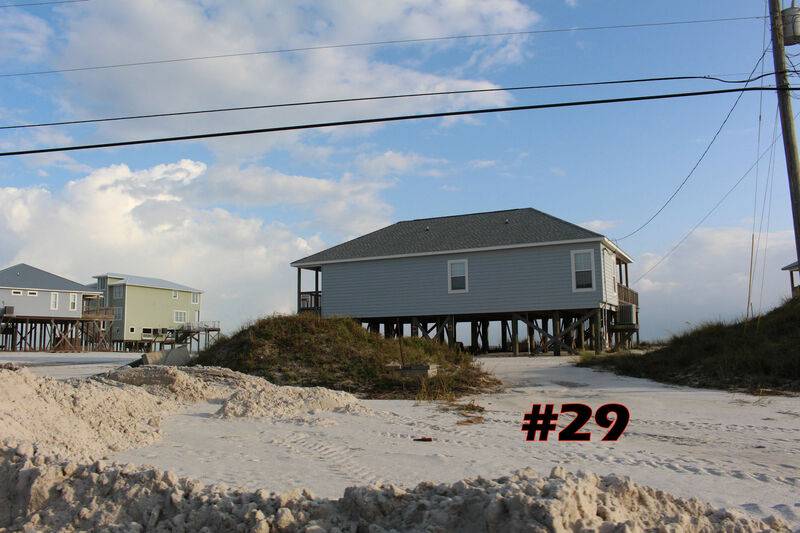 Below are pictures of Boardwalk Realty Vacation Rental Homes located west of the checkpoint area. This is not a complete listing, more pictures will be added soon. Repairs to driveways, stairs, etc will be completed as quickly as possible. 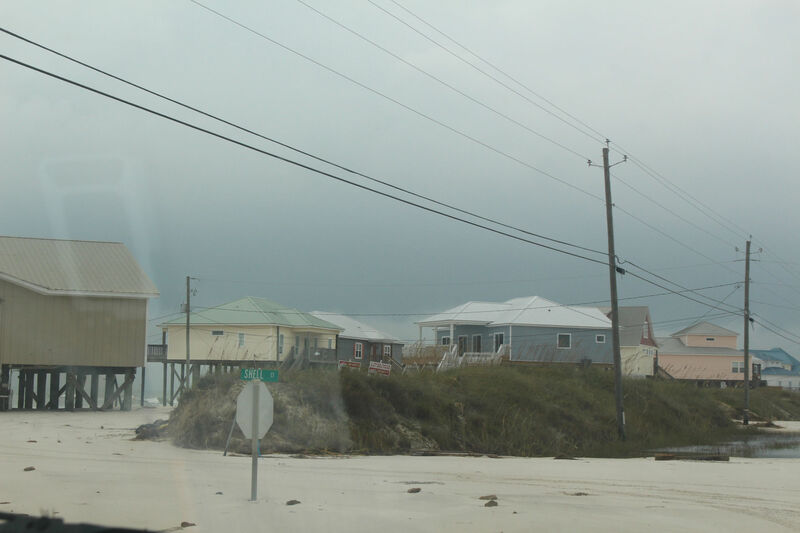 The homes with no damages will also be available as soon as roads past the checkpoint area are passable, water service is restored and rental guests are allowed through the checkpoint. 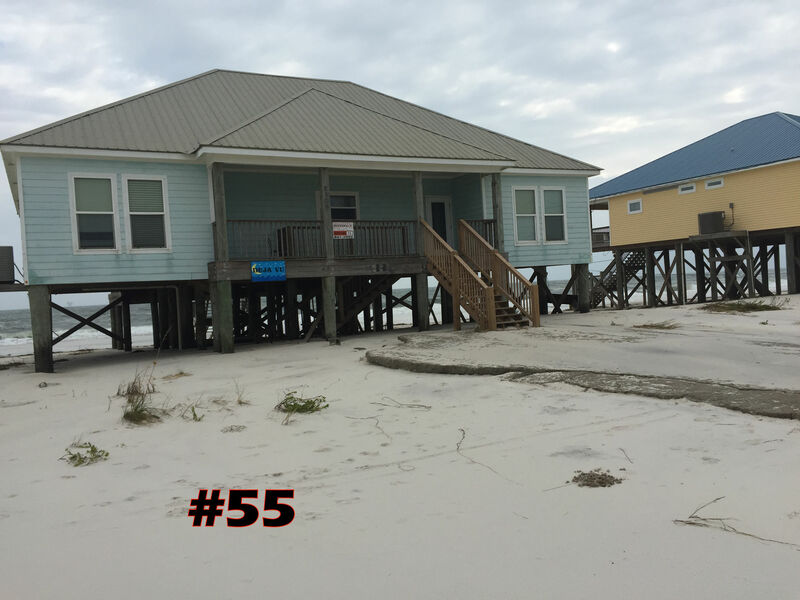 The Town, utility crews and Dauphin Island Water and Sewer are hard at work getting our beautiful Island tidied up for your enjoyment. Click on the pictures to enlarge the image. Below are some photos of the west end taken Monday 10/9/17. Bulldozers are hard at work, but if you are coming to inspect your property please do not attempt to drive past the check point unless you have a 4 wheel drive vehicle. It is easy to get stuck. 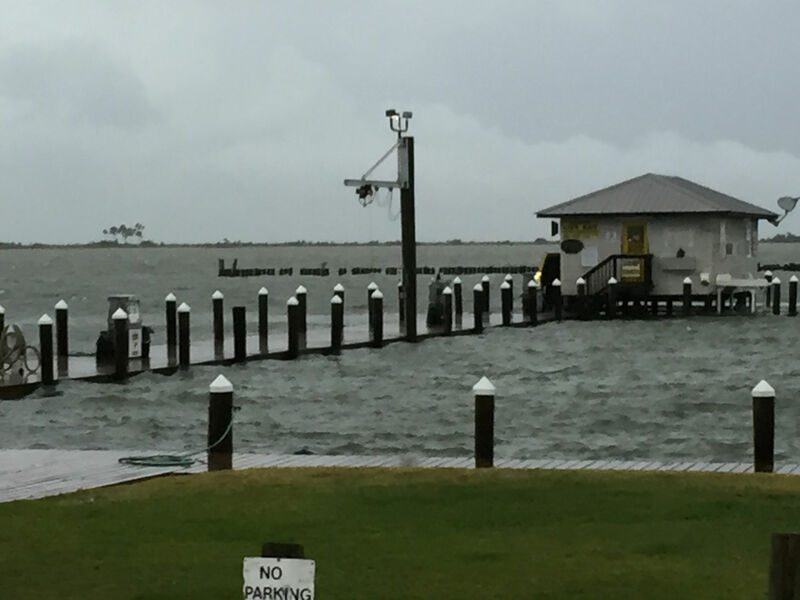 Post-Nate UPDATES: BOIL WATER ALERT is in place for the west end of Dauphin Island ONLY as follows; SOUTH SIDE OF BIENVILLE BOULEVARD from and including St. Denis Court to the west end of Bienville Blvd. NORTH SIDE OF BIENVILLE BOULEVARD from Stephens Street (which is NOT included) to the west end of Bienville Blvd. This DOES include Bridgeview Drive. For additional info please contact Water & Sewer at 861-2363. TOWN DUMPSTERS will be open TUESDAY, October 10 thru THURSDAY, October 12 FOR HURRICANE NATE DEBRIS ONLY! Hold all other debris until the usual FRIDAY/SATURDAY scheduled openings. Thank you! Kudos to our Public Works Dept. for making quick work of clearing massive amounts of storm debris from the causeway this morning! Many thanks to ALDOT and Dept. of Conservation personnel for assisting us with this important task to provide safe passage to and from the island once again. Clearing Bienville Blvd. (approx. St. Denis west to end of pavement) will be an extremely tall order as much of the 3+ mile stretch of roadway is covered in 3-6 feet of sand. 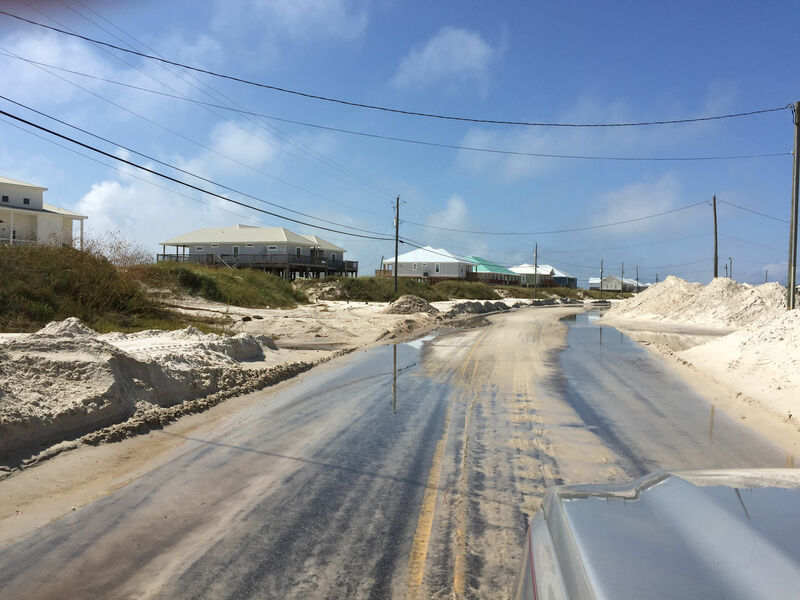 That work should begin to ramp up on Monday and our initial effort will be to simply move sand from the roadway so property owners, utility workers, contractors and others can begin the recovery process. Eventually the sand will likely be screened and returned to the shoreline...BUT this will take some time to complete. Our Police Dept. has set up a check point to allow access to ONLY those individuals with property on the west end, contractors and the like. Access also requires vehicles with 4-wheel drive capability until road is cleared. A BOIL WATER order has been implemented by DI Water & Sewer for portions of the west end. Please contact the DIW&S office and/or website for more specific information. Several folks have asked whether hurricane debris can be placed at roadside and we don't know the answer to that question just yet. Based on the "limited amount" of storm debris, it is probably unlikely roadside pick up will be offered as a result of Nate. If that is the case, the town may be able to offer its dumpsters for hurricane debris ONLY on specified days (TBA). We'll let you know. Finally, Monday, October 9 is a Teacher Work Day at DI School and students have the day off! Copy and paste these links into your browser to view videos taken on the west end on Sunday. All properties east of the police checkpoint at Raphael Semmes were inspected today. 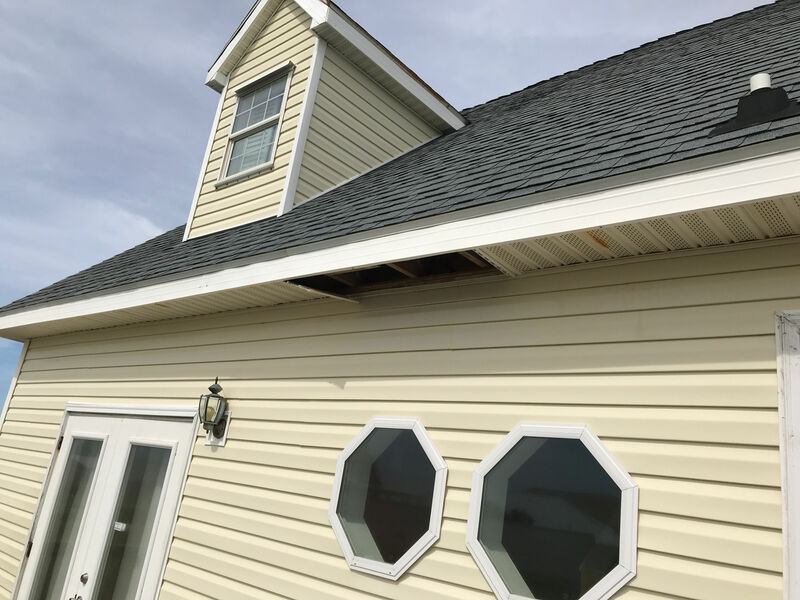 Damages found included small area siding issues, damage to some driveways with sand in some roadways, minor damages to docks and walkways. Property owners east of Raphael Semmes should have received details of any initial damages found today by phone, text or email. We will resume the assessment process tomorrow. 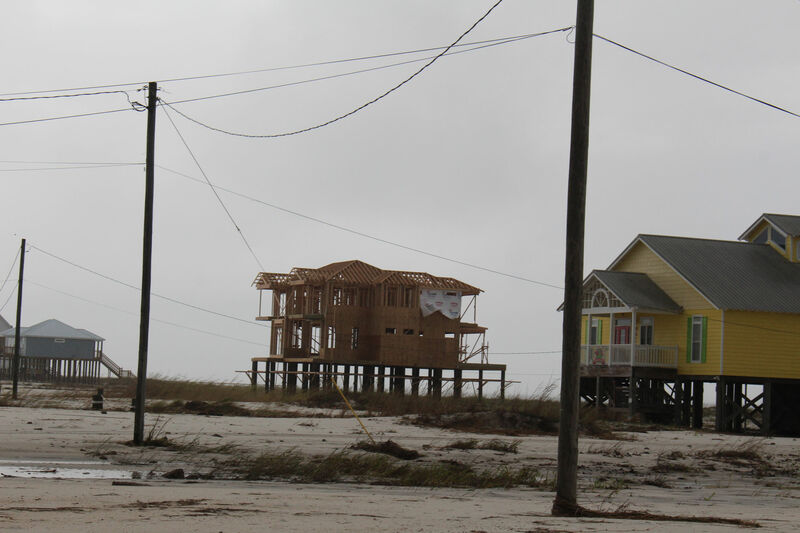 A few homes in this area were still without power as of late afternoon. 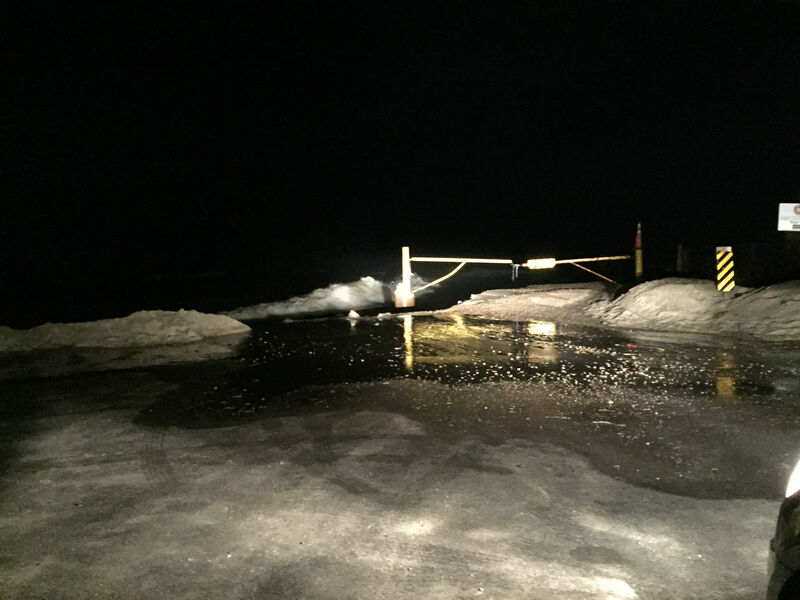 Assessment is expected to continue past the checkpoint tomorrow. 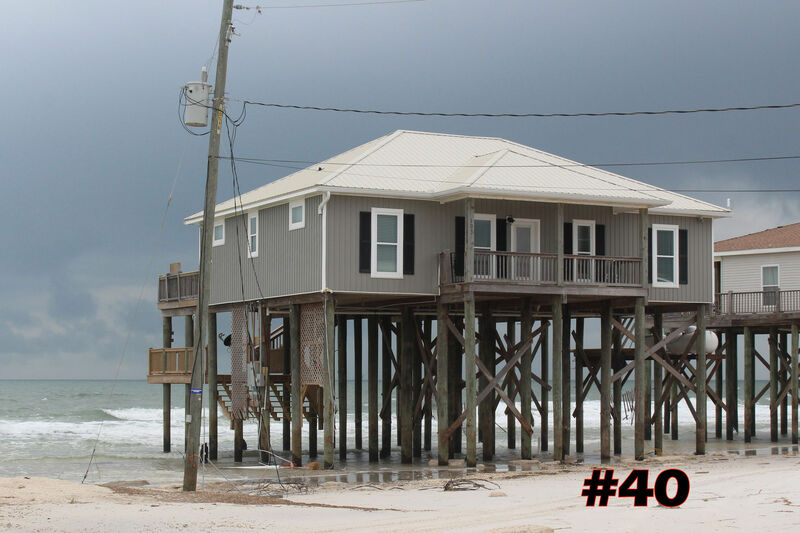 While we were able to get some renters back into their rental units today, guests should not travel to the Island unless we have called you and given the all clear for your specific property address. Please note there is a boil water order for the west end. Posted at 4:30pm - URGENT NOTICE! 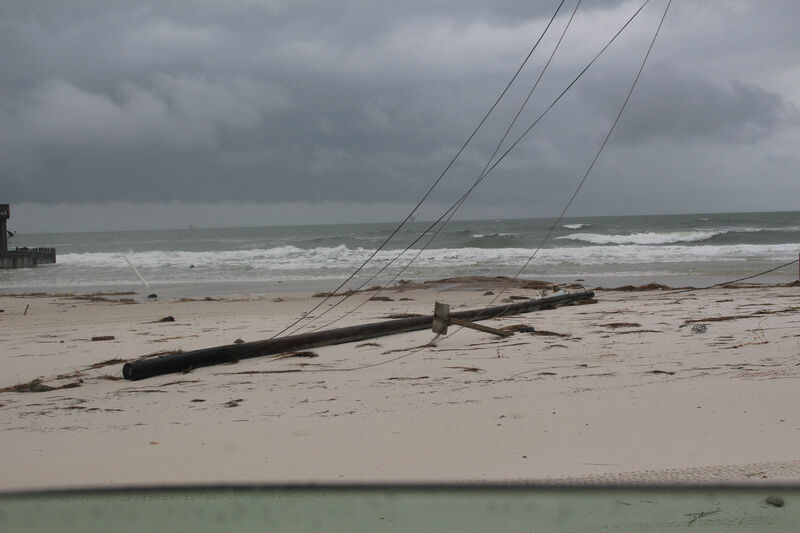 As a result of Hurricane Nate, a power pole north of the Dauphin Island Bridge (near Heron Bay Bridge) will require major repairs. Alabama Power has notified me that a TEMPORARY FIX will be attempted starting within the next 30 minutes. 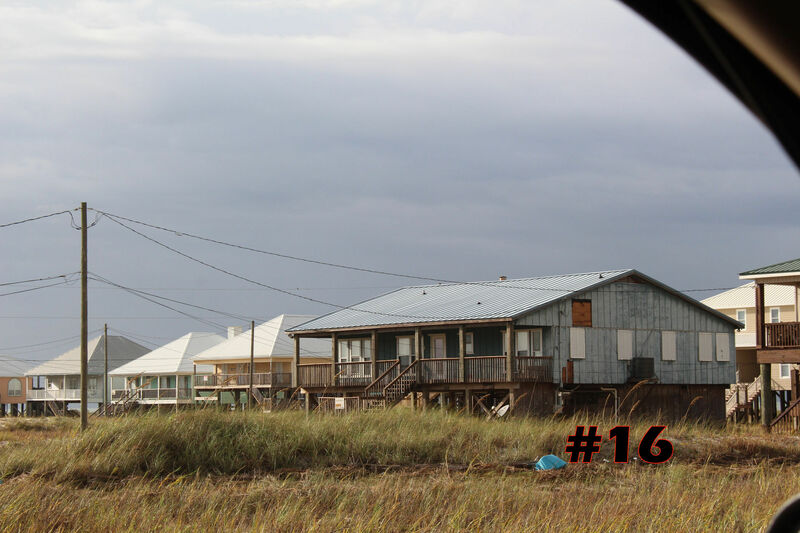 While they DO NOT anticipate any outages during this work, a PERMANENT FIX will need to be accomplished at a later date and WILL require service to the turned off to the island. APC will notify us in advance of that particular project. The causeway to the Island has re-opened to traffic. The west end is still closed to traffic from Raphael Semmes west. Message from Posted from DIPD is below. Bienville Blvd. is closed west of Raphael Semmes St.
No traffic will be permitted while crews are working to clear the road. 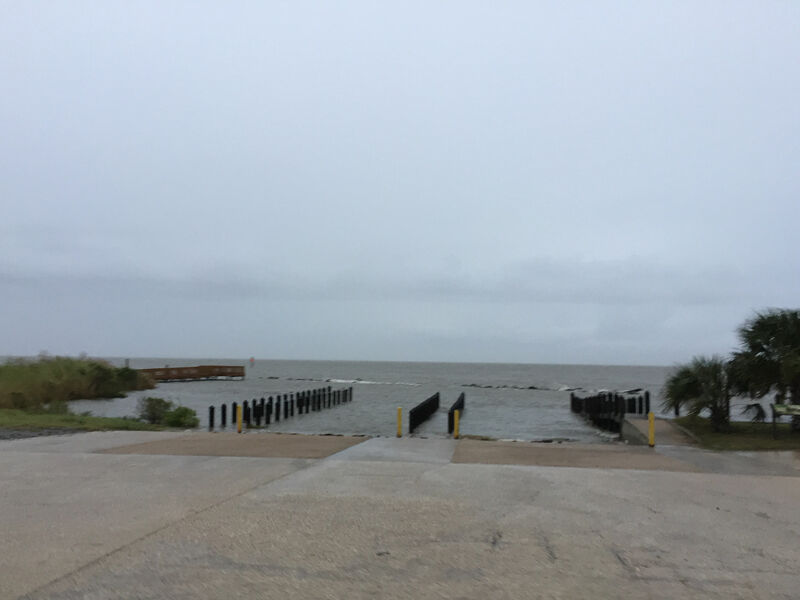 This morning the Causeway to the Island is closed north of the Dauphin Island Bridge for clean up from over wash and debris. We do not yet have an eta on what time it will be re-opened for traffic. 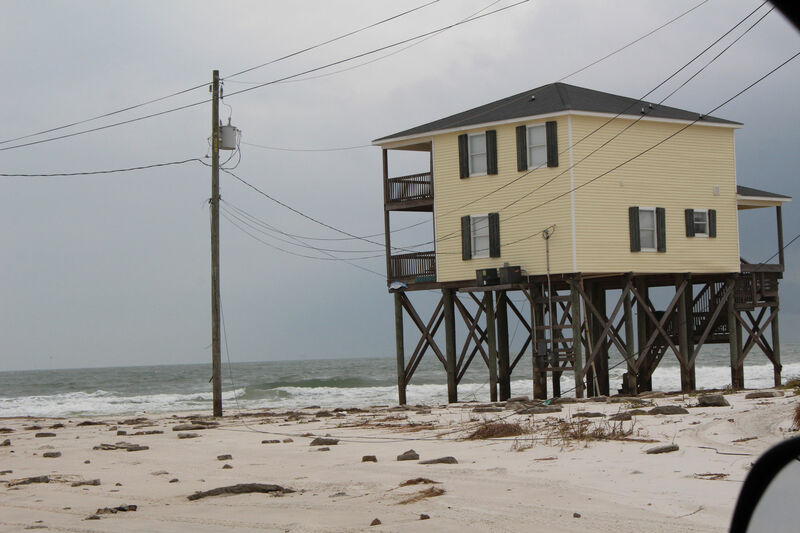 Sporadic power outages are being worked on by Alabama Power and power was restored to the Boardwalk Realty office around 10am this morning. 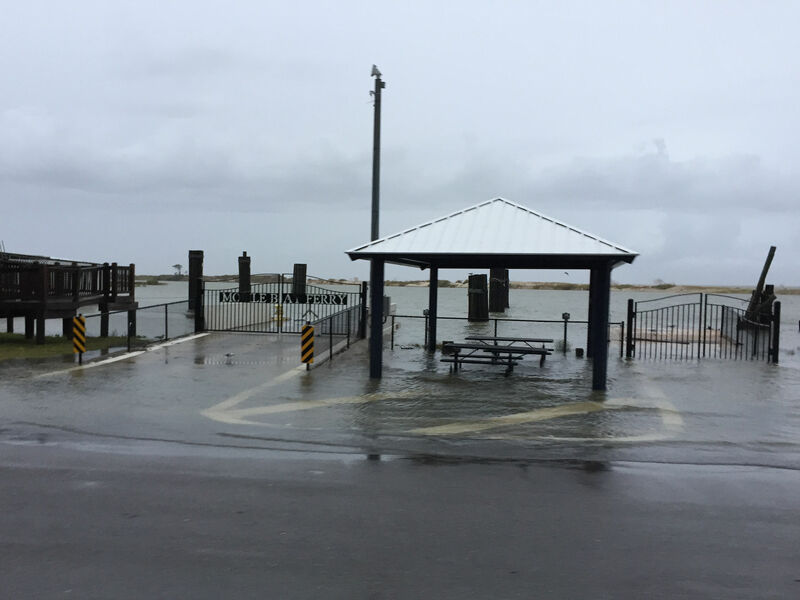 The Dauphin Island Police Department has set up a check point just before Raphael Semmes Ct and are not yet allowing entry while officials evaluate the west end for safety hazards and road conditions. We will be posting information updates here as we are able throughout the day. Guests scheduled to arrive yesterday, today or Monday please wait to hear from us before attempting to proceed to the Island. 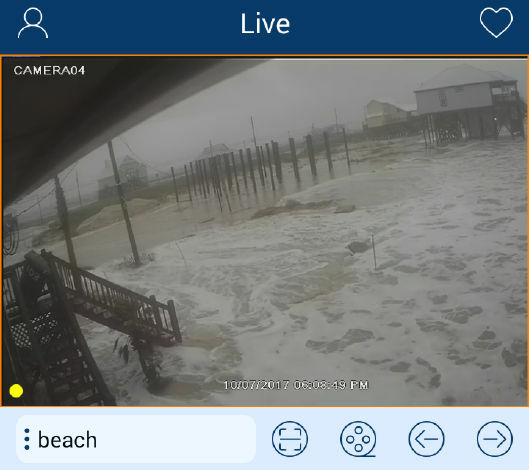 Live Storms Media has posted a few west end flooding videos on YouTube. To View them for yourself go to YouTube and search for Live Storms Media or COPY AND PASTE THESE ADDRESSES INTO YOUR BROWSER. The images are startling and show the speed with which flooding can occur. 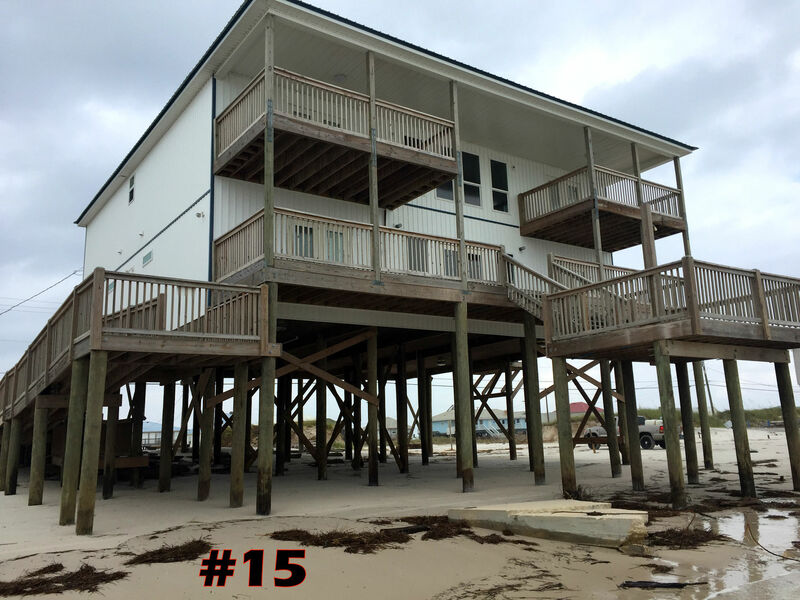 During a phone interview with WPMI Local 15 News, Dauphin Island Mayor Jeff Collier told WPMI anchors that there is salt water flooding on the Island's west end. Flooding of 3 to 4 feet was present in areas earlier this evening and he expects it to potentially worsen. In addition, Dauphin Island Police are currently blocking the west end of Bienville Blvd to prevent people from diving into flood waters. 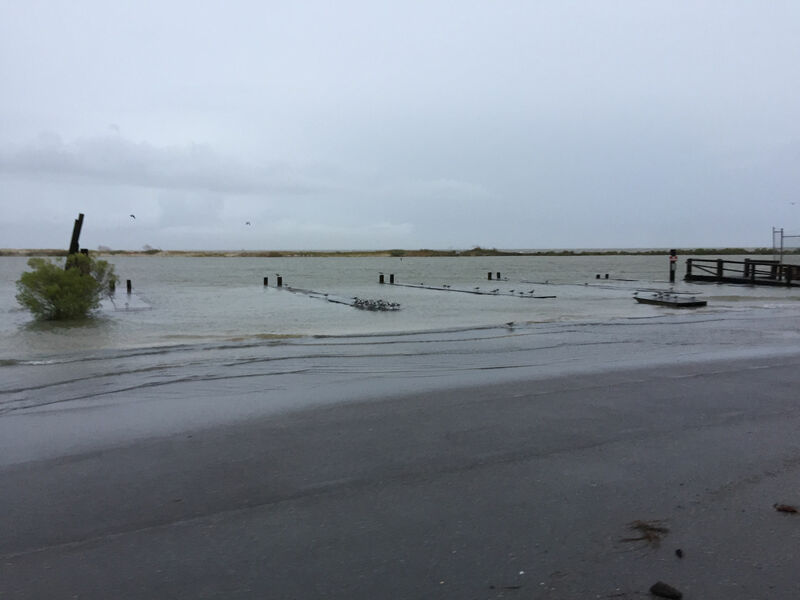 The Mayor also stated that the causeway to the Island is no longer safe to travel due to surf splashing onto the causeway and debris. He expects the Alabama Department of Transportation to close the causeway soon near the Alabama Port Hwy 188 intersection. (Check ALDOT website for a list of road closures). 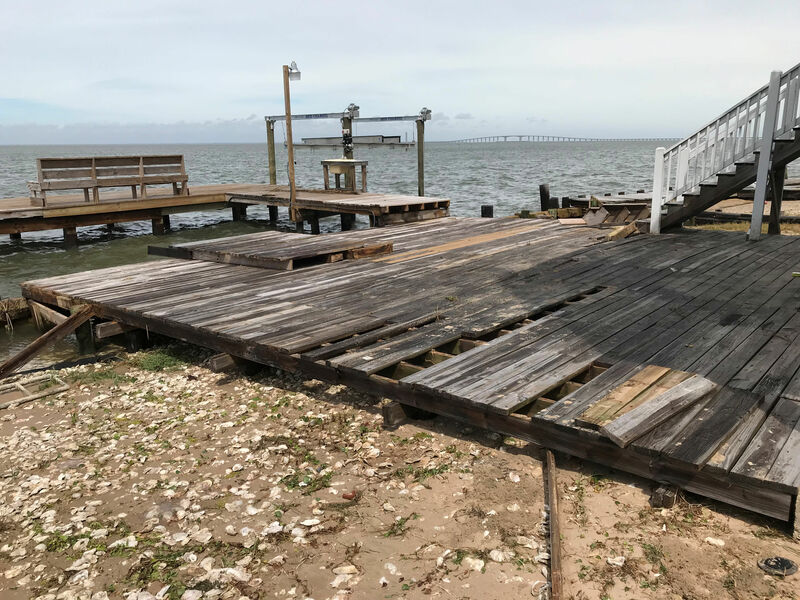 The Mayor stated crews would need to inspect and clear debris from the causeway before it reopens. The Mayor also stated he has been informed there are some homes without power on the Island but the majority of the Island does still have power. He stressed that power crews will not be able to reach the Island to make repairs until the causeway is accessible to traffic. Mayor Collier expects to have personnel accessing damages on Sunday. Visit www.mynbc15.com for local coverage online. Below are some general pictures taken this afternoon from a variety of locations. 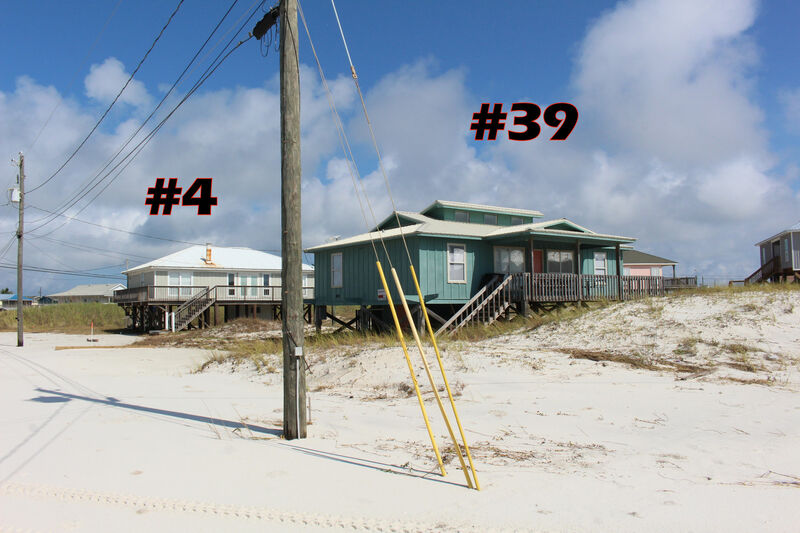 The first three are small in size due to the format but are captured from exterior cameras located at Unit #40 Just Beachy at 103 Tecumseh Ct on the west end. BIG thanks to Greg and Pam for allowing Boardwalk to access the images! 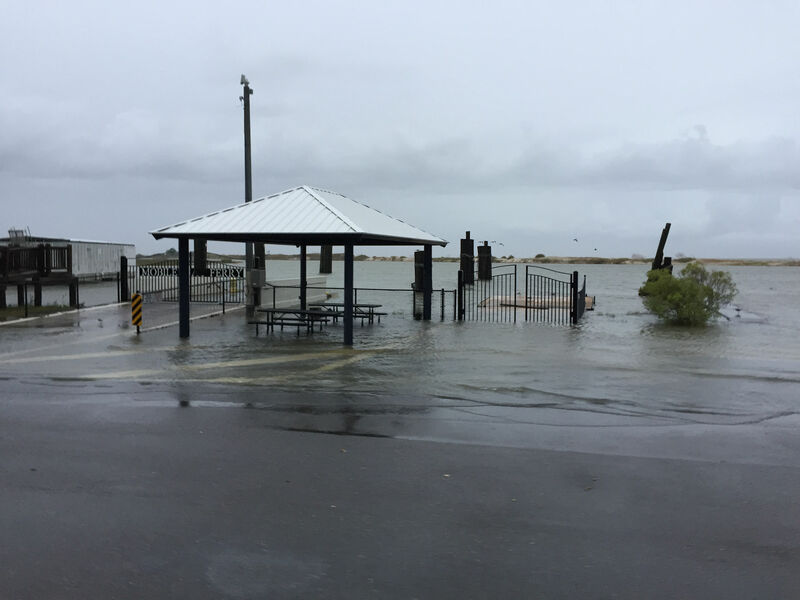 The remaining pictures were taken on the east end around 6pm this evening and show the water rise over the boat launches by the ferry and Fort Gaines. Bienville Blvd is closed to traffic just before the curve to go around the Fort. (Also closed to traffic is the West End with police stationed near President Jefferson on Bienville Blvd and near Port Royal on Cadillac.) 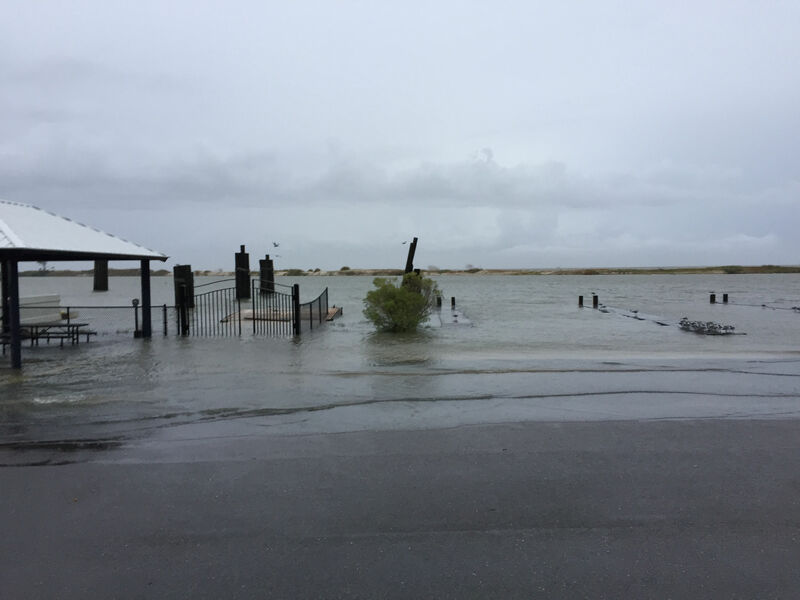 You may also recognize pictures from the Marina, the North shoreline inlet between Port Royal and Polaris Streets. 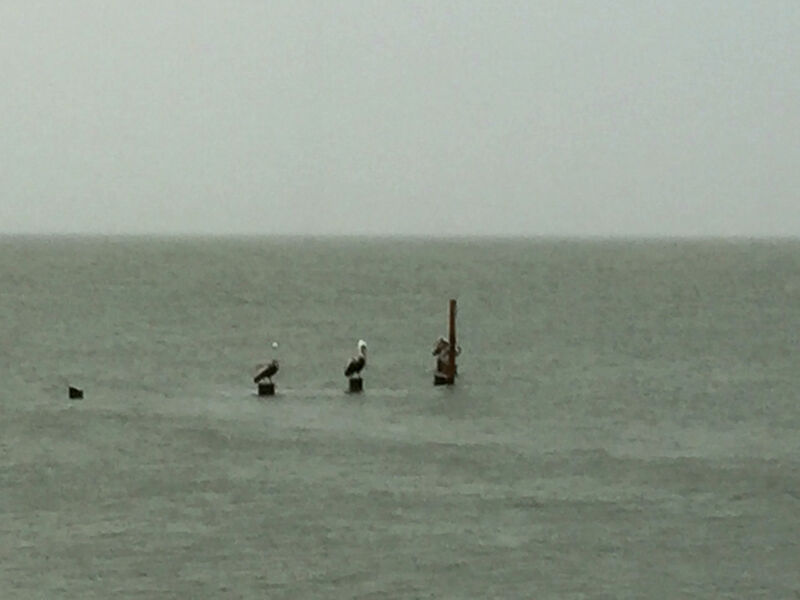 Those of you who've enjoyed the dock and fantastic birding view from Unit #46 Sunset's End on Quivera St may recognize the Pelican perches that usually stick out of the water about 2 feet. 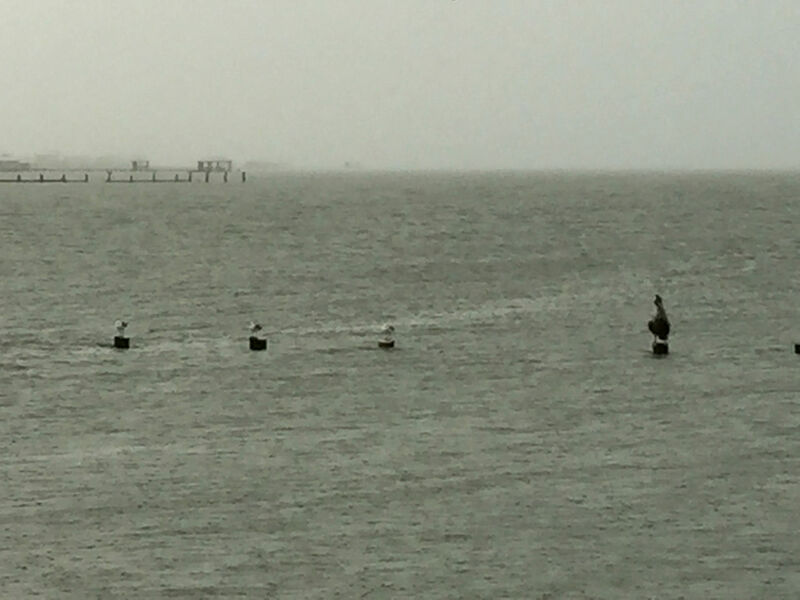 In these images the pelicans and gulls were still hanging out in their regular spots but rising water levels were leaving them with much shorter perches. 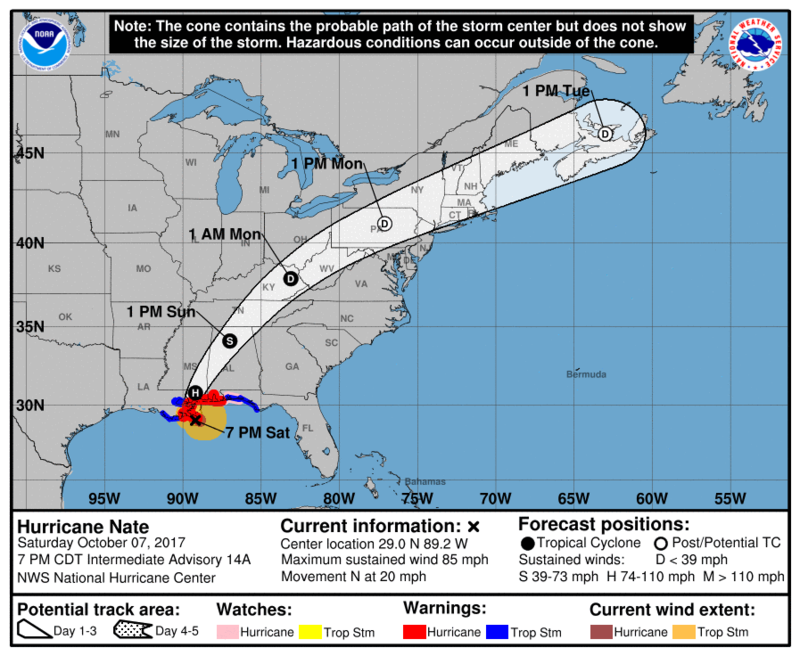 Click below to enlarge the 7pm forecast track for Hurricane Nate. 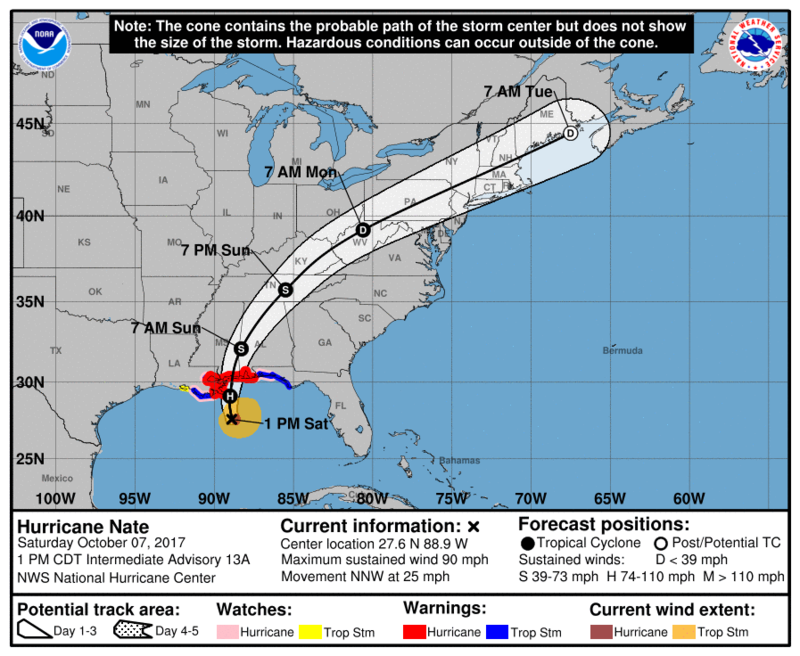 1pm Forecast track of Hurricane Nate and storm surge projections for DI gulf coastal side is greater than 6 feet. We will try to post pictures over the next few days. Theses shots are of the west end of Bienville at 9pm Oct 6th and around Westward Ho this morning at 7am. Check back as more are added. Just click on the images to enlarge them. 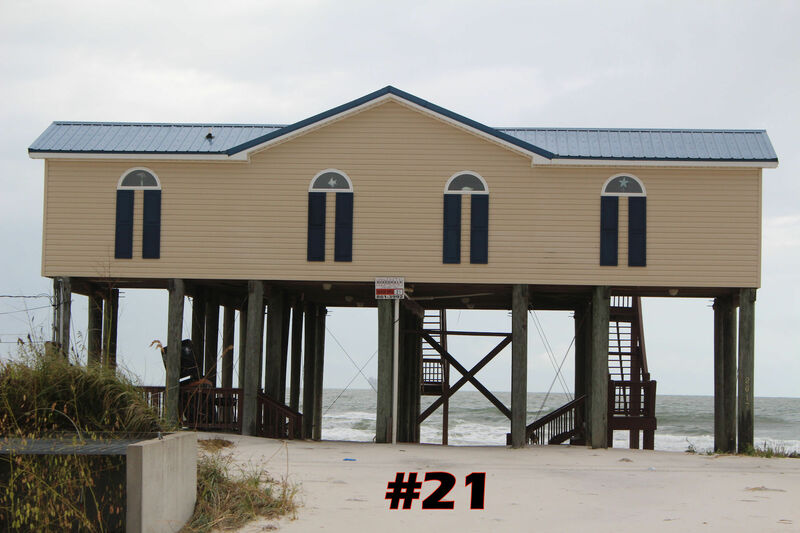 As a barrier island, Dauphin Island is one of the places on the coast most susceptible to tropical weather. 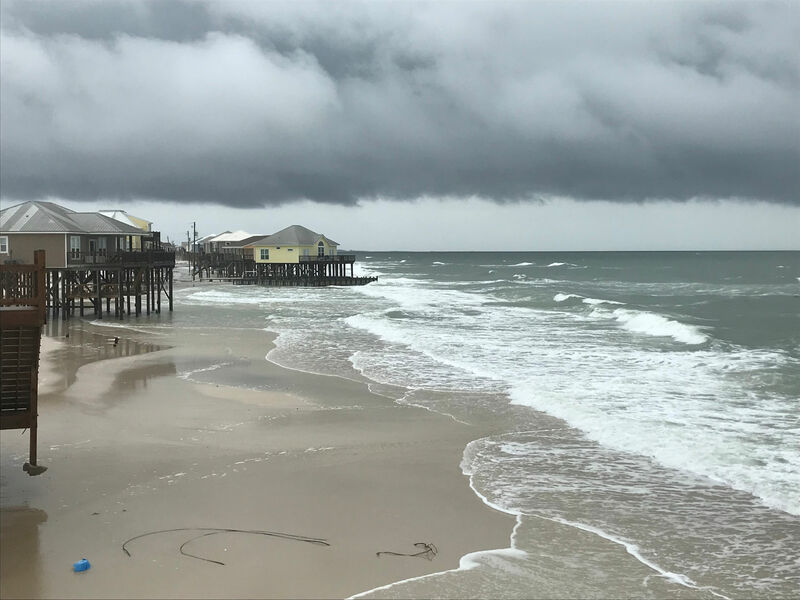 With tropical storm Nate about to enter the gulf; Dauphin Island Water and Sewer is working to maintain water and sewer service to the entire Island At this time we fully expect to maintain service to the majority, if not all, of the Island. That said, the west end of the Island is of particular concern because of its vulnerability to flooding and storm surge/ and the strength and location of landfall will be crucial. If at any point it is determined that the west end poses a risk to the 'system' as a whole/ service to that area will be terminated With employee safety a concern/ master valves that have to be manually closed on the west end will occur prior to roadway flooding. As we know streets on the west end tend to flood and become impassable rather quickly and a decision to continue or discontinue service to that area could come as early as Saturday morning. If service is discontinued, we will work to restore it as soon as possible. 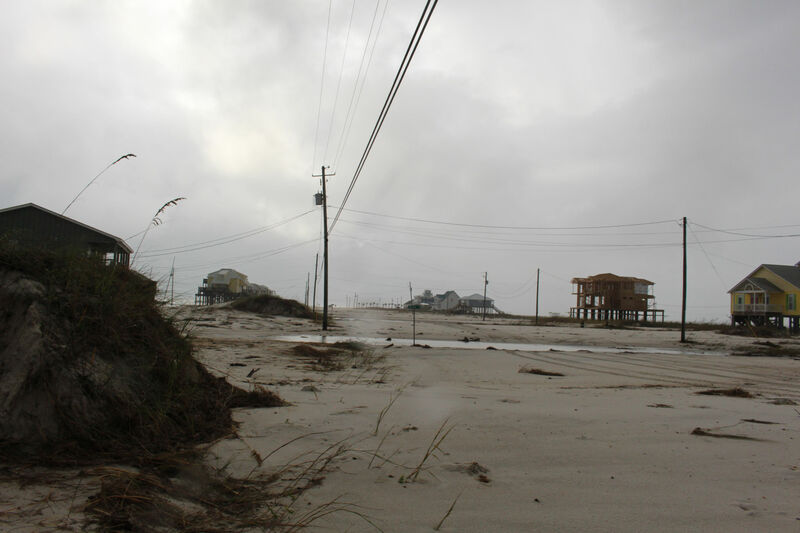 Following hurricanes and or tropical storms/ water is a precious commodity and water loss is a genuine concern. For those with properties that have docks and water lines attached to those docks/ we ask that you shut off water to those areas. 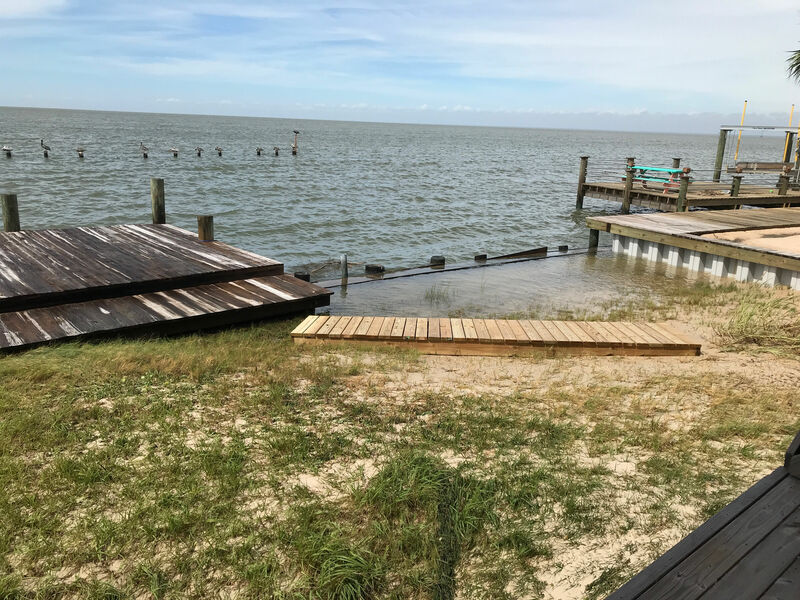 In the past broken water lines due to floating dock-boards have proven to be an enormous burden to the water system and costly to homeowners. 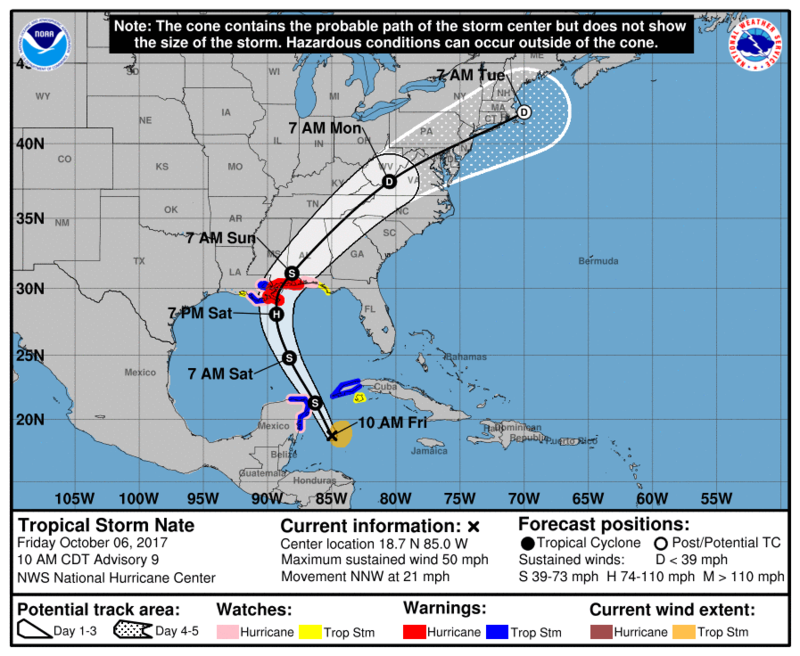 Due to the aforementioned possibilities of impact associated with what could be Hurricane Nate by the time it makes landfall, you are strongly encouraged to take ALL necessary precautions to protect life and property up to and including voluntary evacuation from all vulnerable areas on the island. Keep in mind that emergency response personnel may NOT be able to respond during certain weather conditions ... be careful and most of all be smart! Our Police Dept. (861-5523) will remain operational throughout the storm. All guests scheduled for arrival over the next few days should contact our office toll free at 1-877-861-3992. 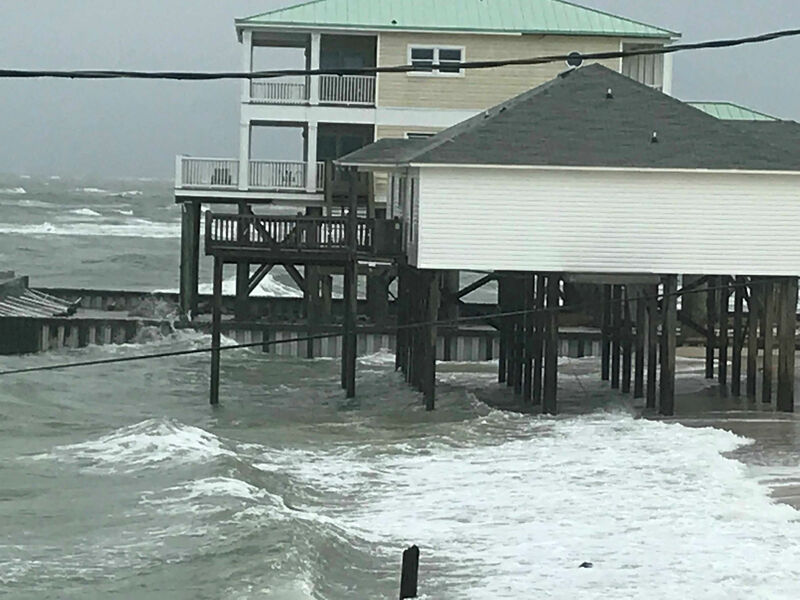 Our area of the Gulf Coast has been placed under a Hurricane Warning and Storm Surge Warnings are in effect with expected impacts this weekend. 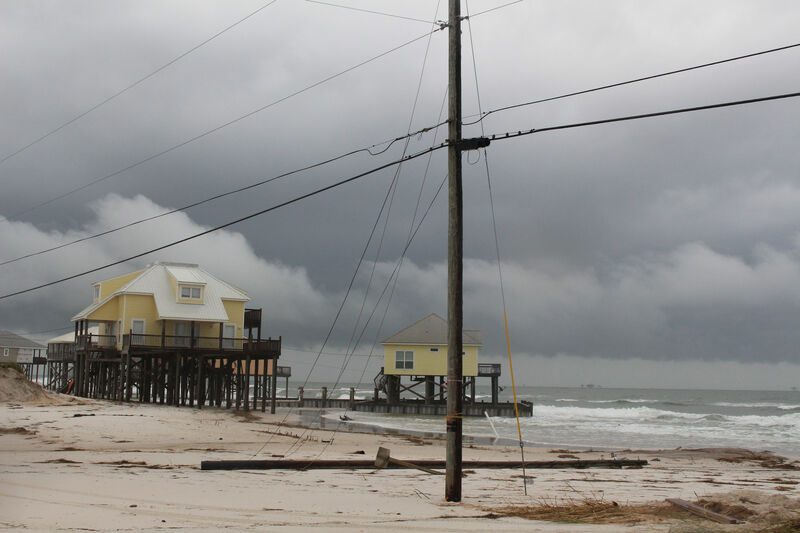 The detailed Forecast for Dauphin Island from The National Weather Service at Weather.gov. 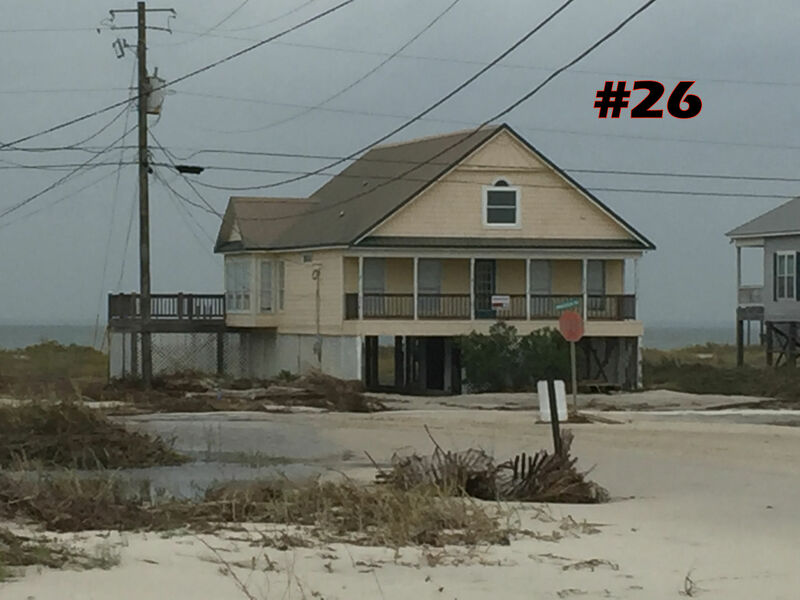 To use weather.gov for Dauphin Island weather updates in real time, visit weather.gov then enter Dauphin Island's zip code: 36528 in the top left search box. To view the latest map from the National Hurricane Center please click on the image below to enlarge it. Additional news and updates will be posted on the this page, please check back for additional information. 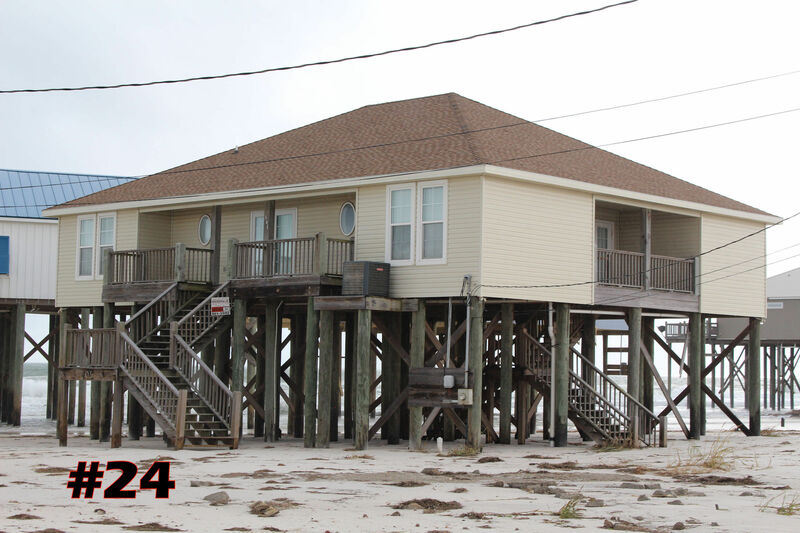 Dauphin Island Love Benefit for St. John Rescue is coming up Sunday evening. 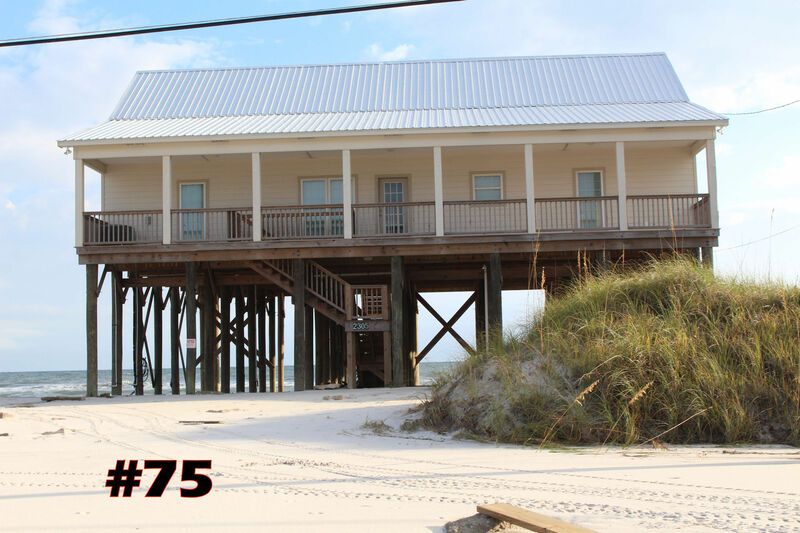 The event starts at 5 p.m. Sunday, Sept. 17, at Dority's Bar & Grill, 1010 Bienville Boulevard on Dauphin Island. A performance by Slide Bayou begins at 6 p.m.
Ryan Balthrop, one of the event's organizers and one of three singer-songwriters in Slide Bayou alongside Lee Yankie and Harrison McInnis, said the event came about partly because the organizers, including himself and Brooke Million O'Donnell, have lived on the island and maintained ties there since moving back to the continental U.S.
"They are U.S. citizens," Balthrop said. "A lot of people don't even realize that." "It's been a terrible week," he said, as he and others waited for word to emerge about the fate of friends on the island. O'Donnell seconded that. "These past 10 days have been long and excruciating," she said. The word that has come from the islands hasn't been good. It's expected to take months to restore power. Even the leaves of plants were scoured away. "It's all brown," O'Donnell said. "It's hard to look at the pictures." 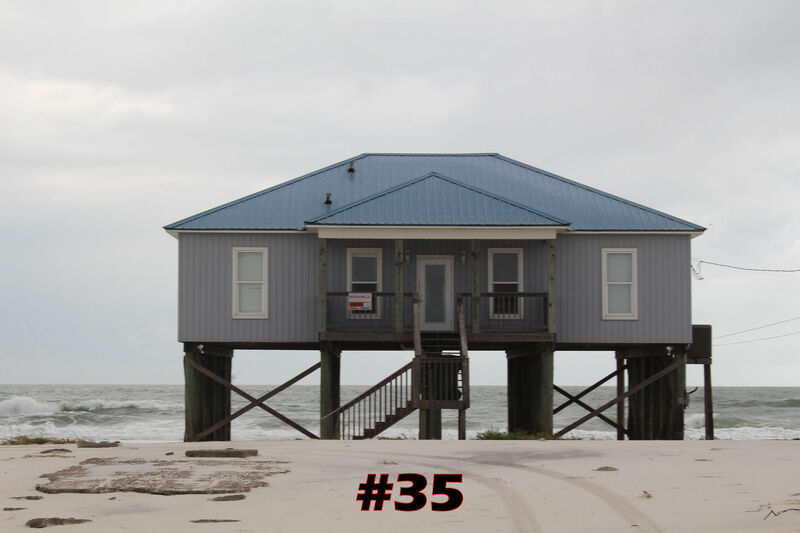 For islanders, it's hard even to lay hands on the bare necessities needed to start rebuilding. "They can't just get in a car and drive to Home Depot," she said. 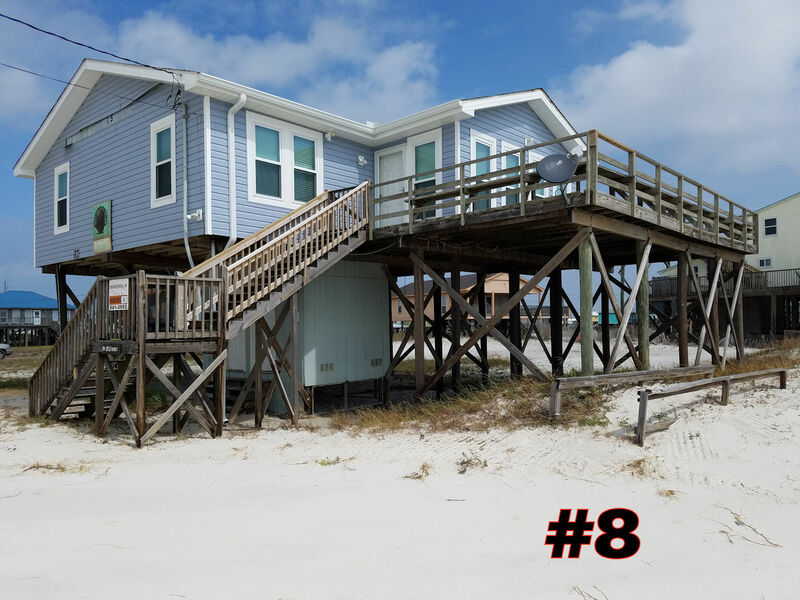 Enjoy pictures taken this evening (Sunday 9/10/17) from the deck and crow's nest (rooftop deck) of Boardwalk Realty rental unit #12, Semper Fi. 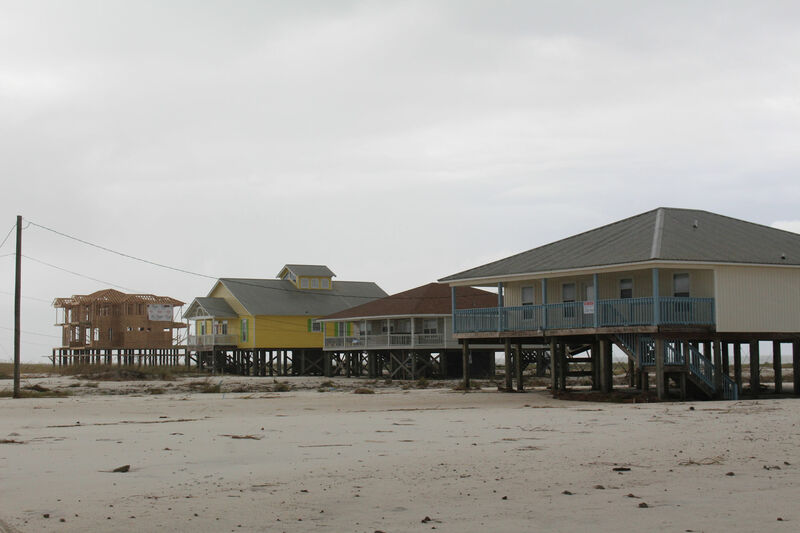 The first picture is a panoramic view showing the Gulf beach to Mississippi Sound shorelines. To view pictures full size, just click on each picture to enlarge. Detailed Forecast for Dauphin Island from The National Weather Service at Weather.gov. 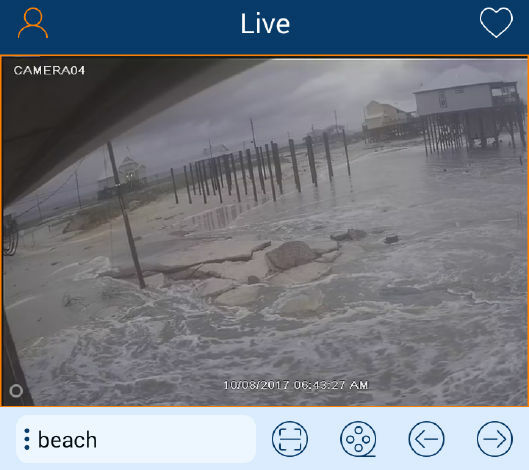 To use weather.gov for Dauphin Island weather updates in real time, visit weather.gov then enter Dauphin Island's zip code 36528 in the top left search box. Use this great tool for your home area weather by entering your zip code. This Afternoon - A 20 percent chance of showers. Partly sunny, with a high near 79. Windy, with a northeast wind around 25 mph, with gusts as high as 35 mph. Tonight - Partly cloudy, with a low around 68. Windy, with a northeast wind around 25 mph, with gusts as high as 40 mph. 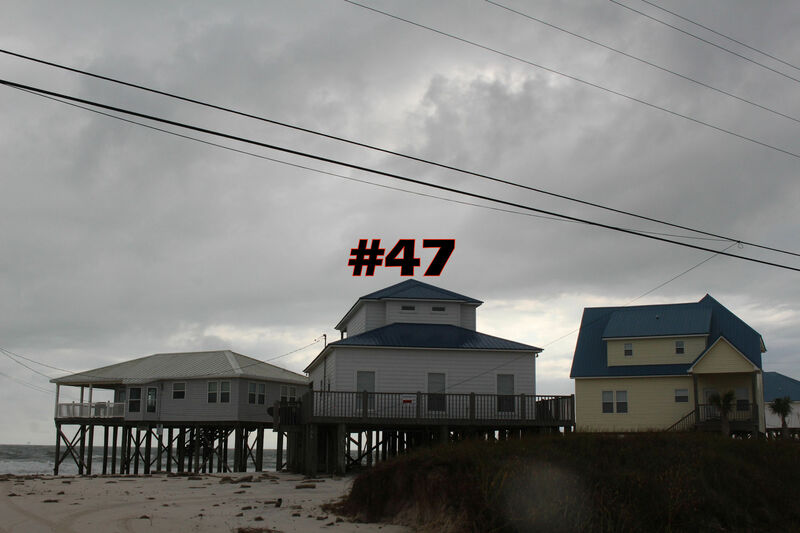 Monday - A 20 percent chance of showers and thunderstorms. Mostly sunny, with a high near 79. Windy, with a north wind 25 to 30 mph, with gusts as high as 45 mph. Monday Night - Partly cloudy, with a low around 67. Windy, with a northwest wind 20 to 25 mph, with gusts as high as 35 mph. Tuesday - Sunny, with a high near 79. West wind around 15 mph, with gusts as high as 25 mph. Tuesday Night - Mostly clear, with a low around 71. West wind 10 to 15 mph, with gusts as high as 20 mph. Wednesday - A 20 percent chance of showers. Mostly sunny, with a high near 82. Southwest wind 10 to 15 mph. Wednesday Night - Partly cloudy, with a low around 74. Southwest wind around 10 mph. The local forecast continues to show the worst of Irma missing us to the east. Below is an excerpt from WKRG TV 5's 7am Sunday update. To see the video and read the full article click here. 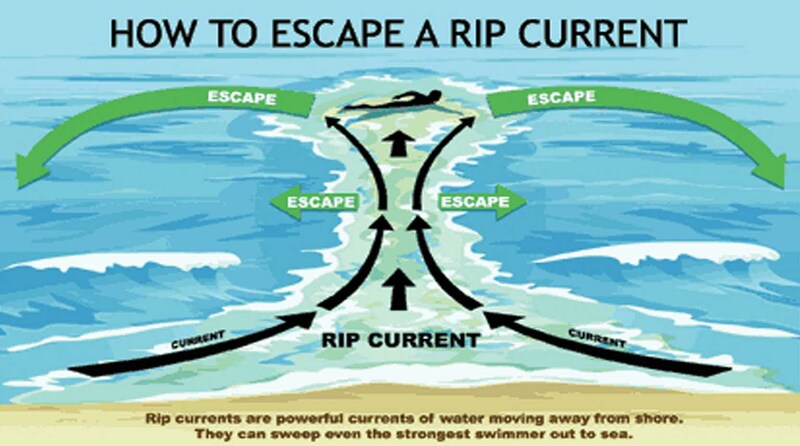 Not sure how to recognize or react to a rip current? 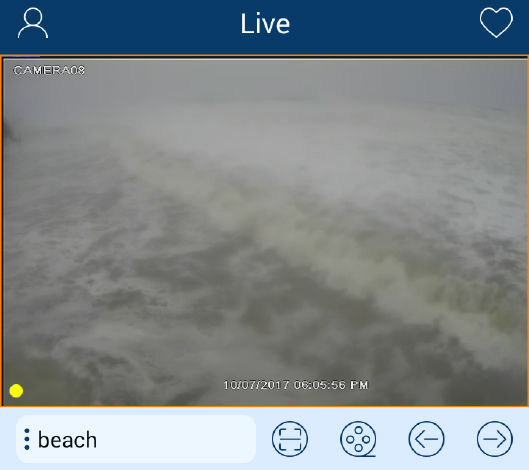 Visit the National Weather Service rip current safety webpage. Surf forecast information is available here year round. 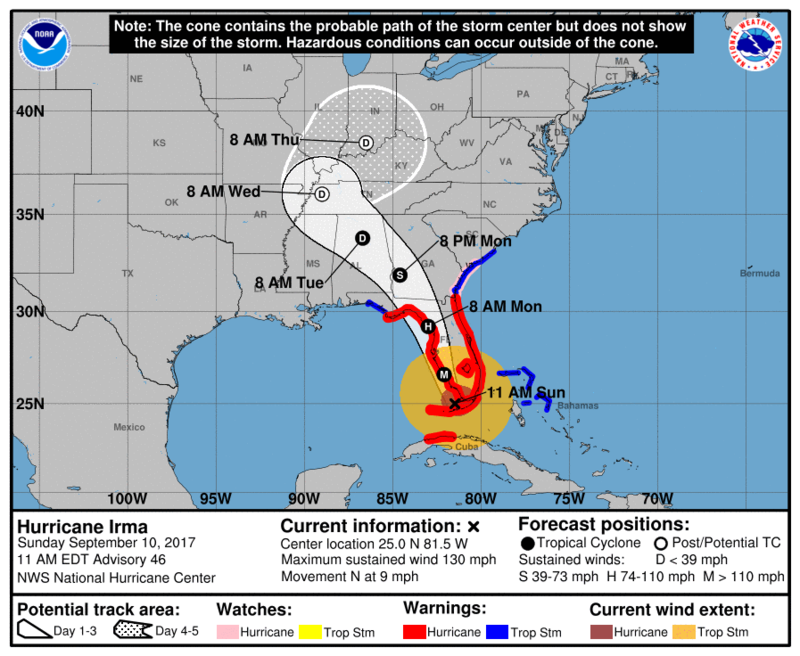 Florida's Irma evacuees have streamed into Alabama and for those guests staying here on the Island, here are quick links to weather information. 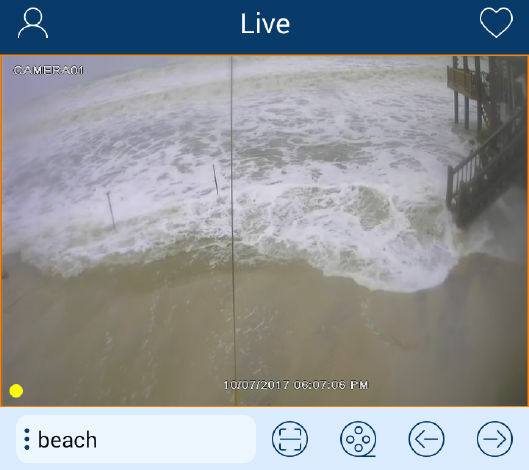 Great smart phone and tablet Apps for Hurricane Information are: Hurricane Tracker by EZ apps, Hurricane Pro by Kitty Code, The Weather Channel, MyRadar NOAA Weather Radar. Aye Tides by Hahn Software is a good way to monitor high and low tide schedules. 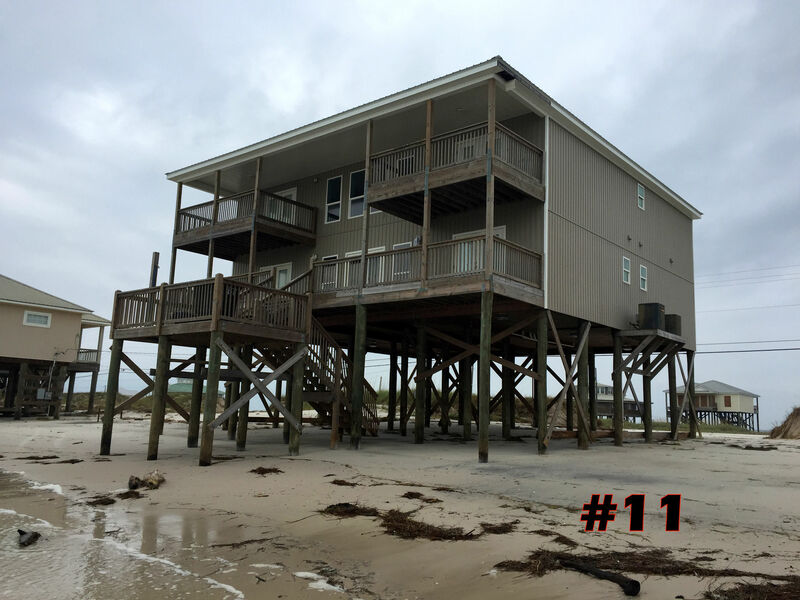 If your rental property has Comcast Cable, local weather/news channels are: 13-The Weather Channel, 11-CNN, 50-FOX News, 5-WKRG/CBS, 10-WALA/FOX, 4-WPMI/NBC. 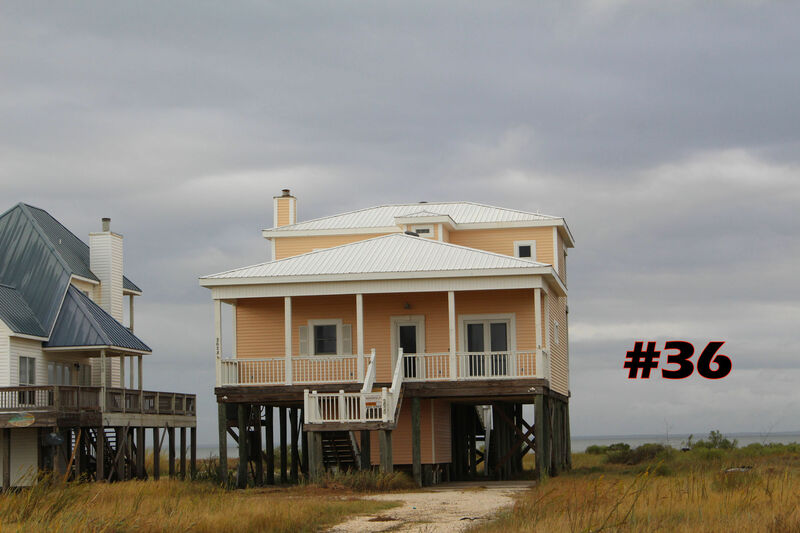 If your rental property has DircTV local weather/news channels are: 362-The Weather Channel, 202-CNN, 360-FOX News, 5-WKRG/CBS, 10-WALA/FOX, 15-WPMI/NBC. 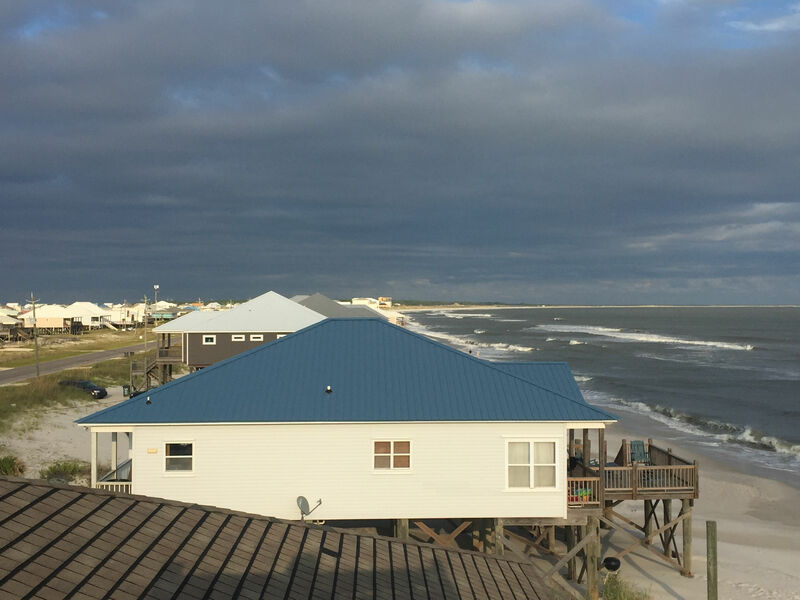 Sunny skies today over Dauphin Island while all eyes are on Irma and we continue to monitor forecasts. Hurricane Irma is a Category 3. Irma made landfall in Cuba last night as a category 5 hurricane. The first category 5 to directly hit Cuba since the 1920s. Irma has weakened due to the land interaction with Cuba, but as it turns north it is forecast to restrengthen. Hurricane warnings cover most of central and south Florida. The Irma track forecast into the weekend looks like it will keep us on the dry, calmer side of the storm; but it won’t be calm for much of Florida. It could be near-catastrophic. 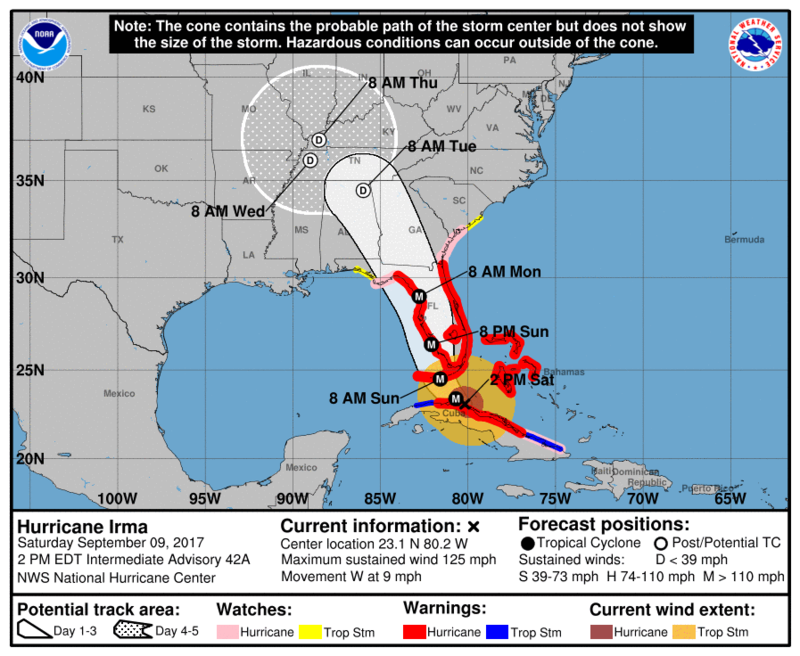 Right now the Florida Keys and southwestern side of the Florida Peninsula and the is likely to feel the brunt of Irma. 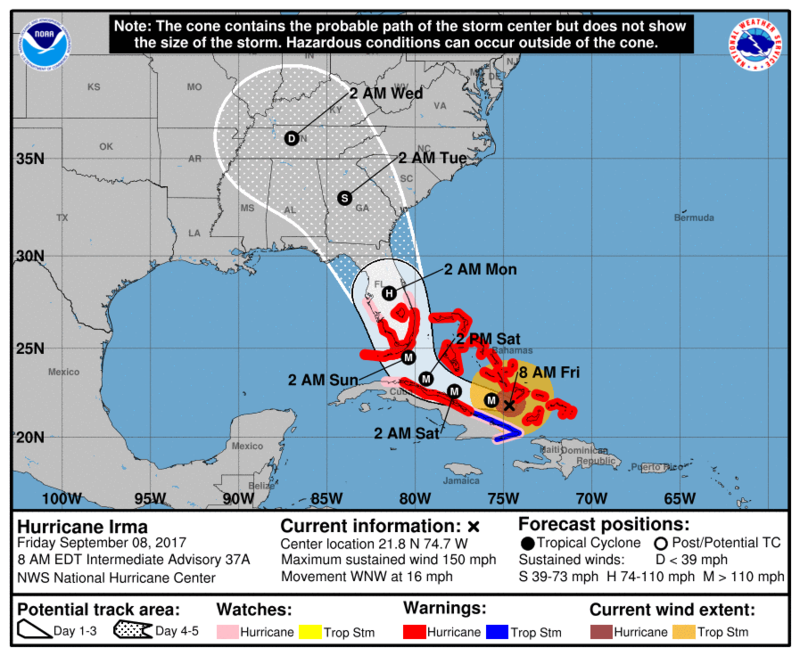 All of south and central Florida will likely be impacted after Irma moves over the Keys early on Sunday. The odds of Irma heading directly to the News 5 area remain low. 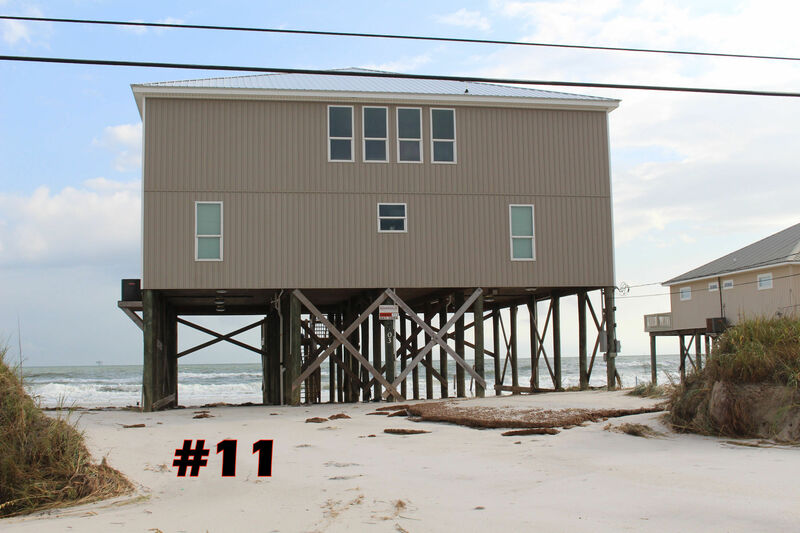 Be prepared as you would normally be during hurricane season. At the moment we stay on the dry side of Irma, with a northeast breeze this weekend. We may still get some showers on Sunday and Monday but those would be more likely east of Mobile Bay. Elsewhere in the Atlantic Jose is a category 4. That makes it the third major hurricane of the season. It is well-east of Irma in open waters close to the Leeward Islands. Today Jose will impact the same islands Irma moved over, but the full force of the storm should miss the islands to the north. What was Hurricane Katia is no longer. It made landfall in the state of Veracruz in Mexico. Since moving inland it has dissipated, but still poses a flooding threat to central Mexico. Closer to home you couldn’t ask for better weather. Sunshine and temperatures slightly below average today and tomorrow, with highs in the middle 80s. Tonight is just like last night with comfortable temperatures in the lower 60s under clear skies. Sunday gets breezier, especially east of Mobile Bay, but gusts over 35 mph is unlikely. Highs stay in the lower 80s with partly cloudy skies and a few showers possible. Monday is more of the same, but as Irma moves north past Georgia from Monday and Tuesday we return to quiet and pleasant weather. 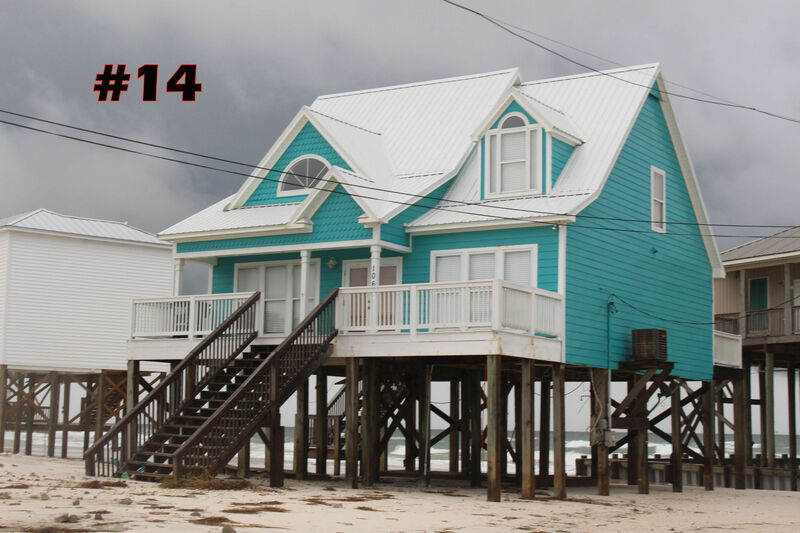 This is the time of year when hurricanes are on everyone’s mind. 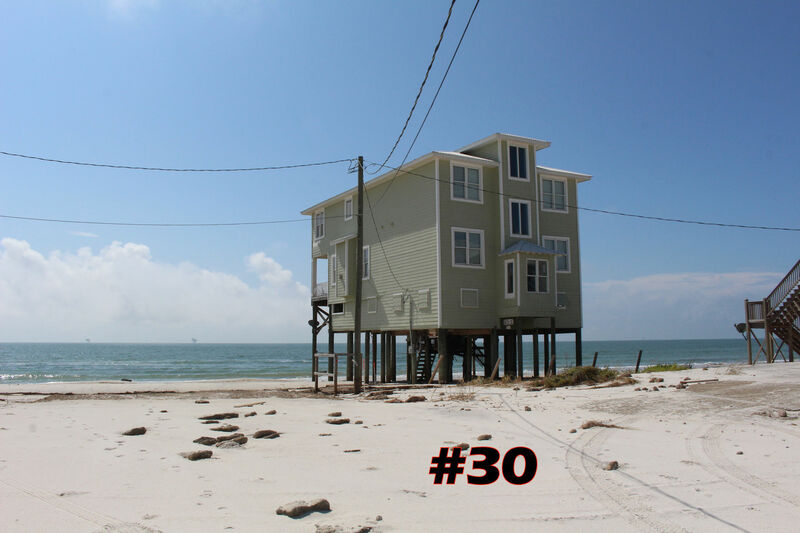 But, many people may not know that late August this year was the 300th anniversary of the first recorded hurricane to hit the Gulf Coast. 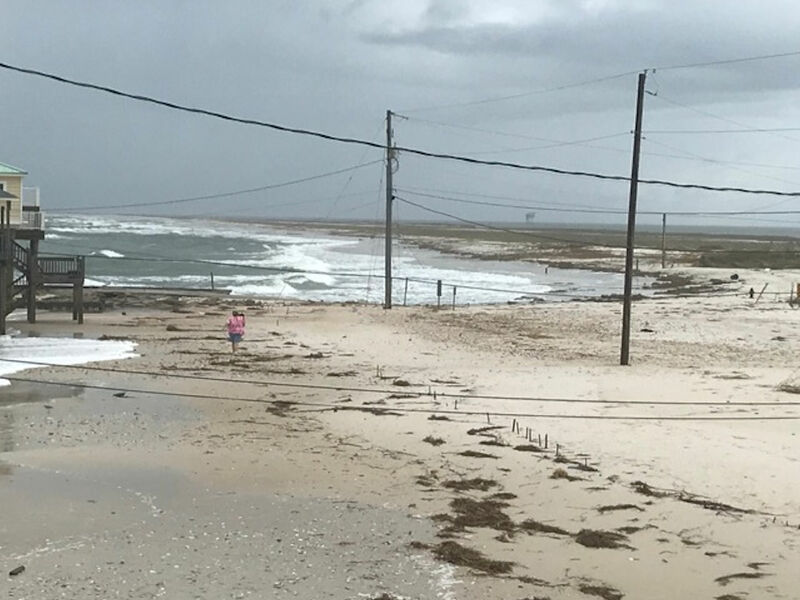 Fortunately we have an eye-witness to the storm that first came ashore at Dauphin Island and likely inflicted damage to the Mississippi Coast as well. 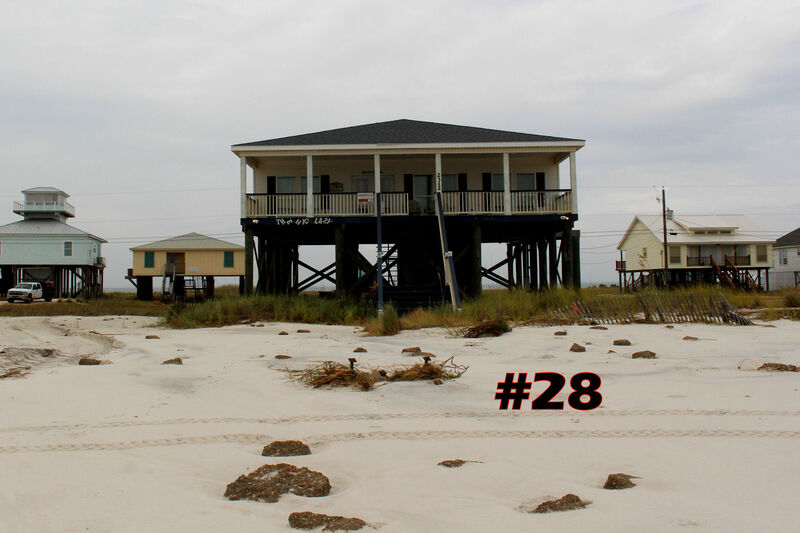 Dauphin Island’s original name was Massacre Island because of the many human remains that Iberville found when he explored the island on Feb. 3, 1699. 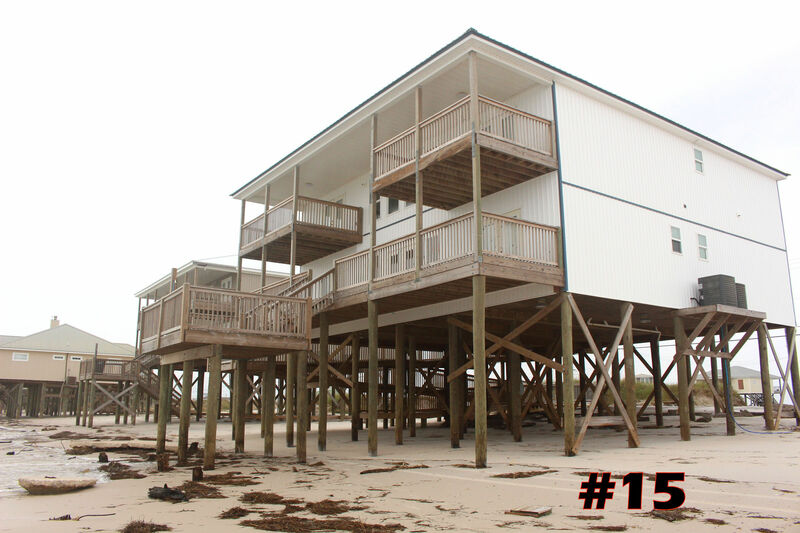 Bienville changed the island’s name to “Isle Dauphine” in 1711. Click here to read the full Sun Herald article by Murella Powell. 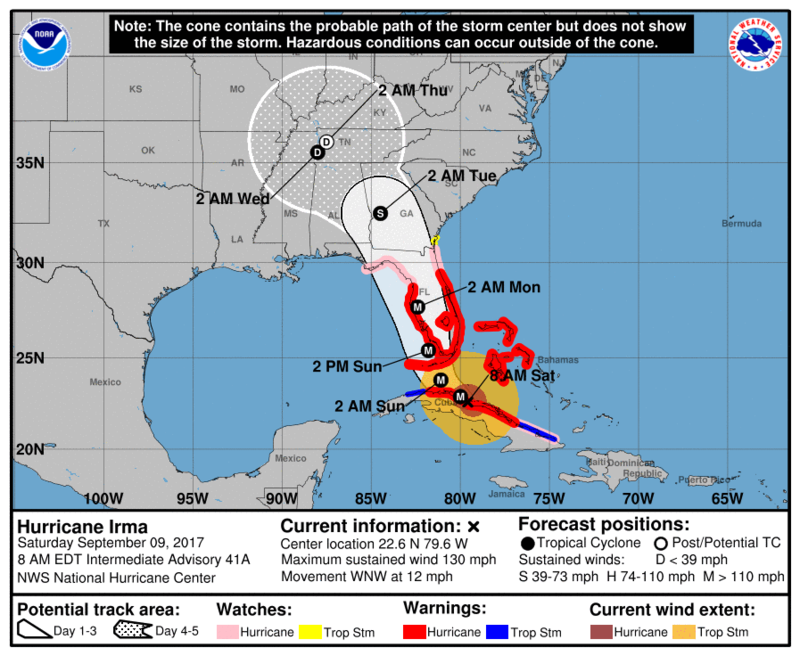 The final day has arrived for Florida to finish all preparations and evacuations. Irma will bring tropical storm conditions later today followed by intense hurricane conditions tomorrow morning. Irma will make landfall along the west coast of FL Sunday afternoon as a major hurricane with winds near 150 mph. 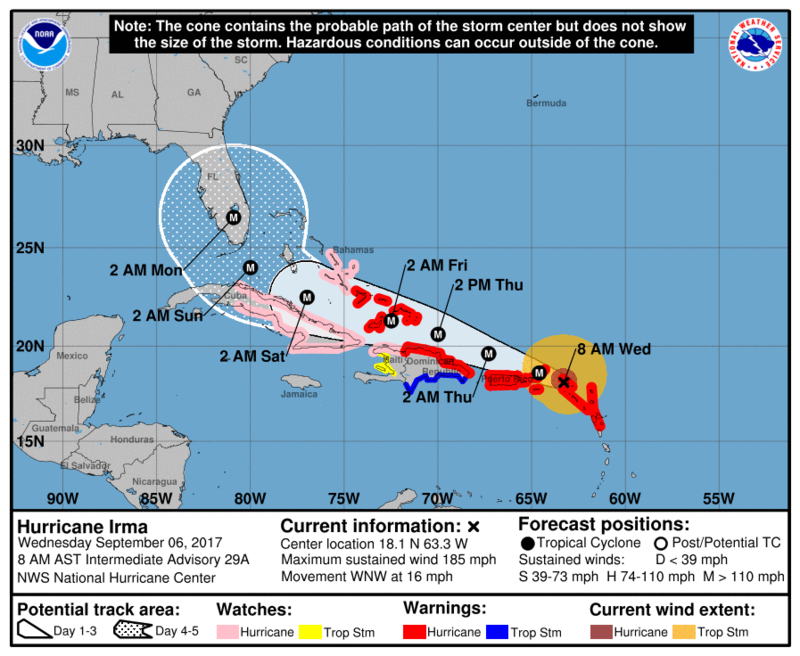 Hurricane Irma continues to inch its way closer to the United States. Today, it will impact the Central Bahamas as a strong category 4 storm. It is headed for warmer water, so there is the potential it re-strengthens again before landfall in south Florida on Sunday. 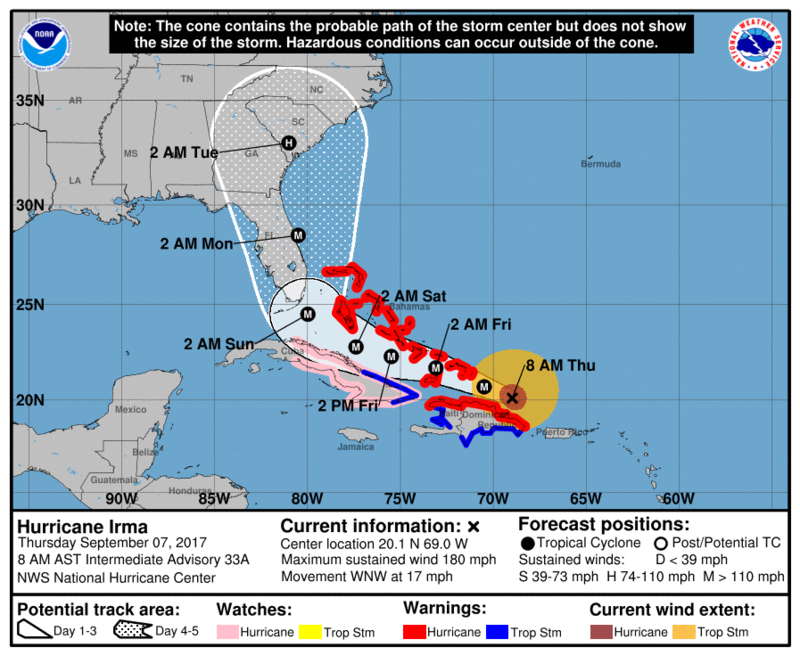 Track (Long-Term): The uncertainty of Irma increases by day five. At this point, there is the potential Irma makes landfall on South Florida and the Florida Keys. This morning’s model guidance has trended east, however. If it takes this track, which is appearing more likely at this moment, it will make a sharp, right turn and move along the Florida coast and eventually getting into South Carolina. If you recall last year, this is a very similar track as Hurricane Matthew, but this storm may be even stronger. If you are Florida, Georgia, and the Carolinas, you need to get prepared now. 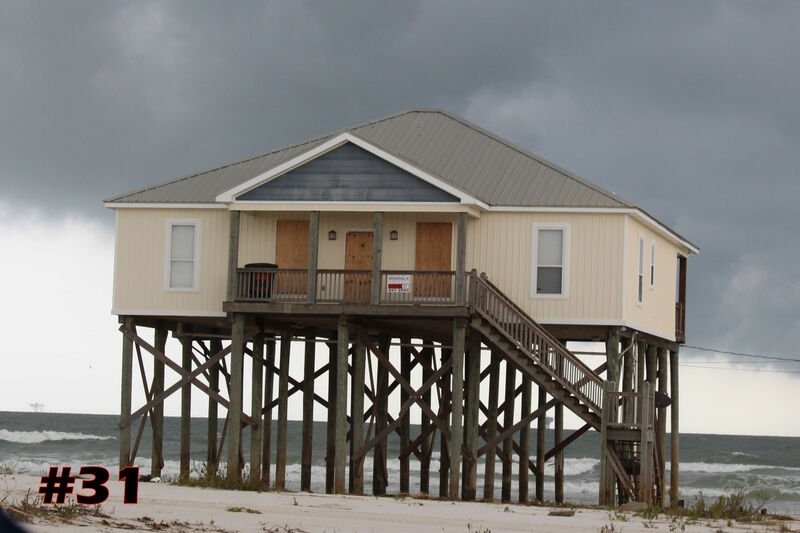 Even if a landfall is not guaranteed where you are, you may still deal with tropical-storm-force winds and it’s always good to be prepared just in case. There is still the chance Irma takes its sharp-right turn a little later in time and it goes into the eastern Gulf of Mexico, but that chance is low. Also the chances for direct impacts to the Northeast are continuing to decrease. A few of the ensemble members take Irma into the Northeast, but the main focus in the guidance is on the Southeast. 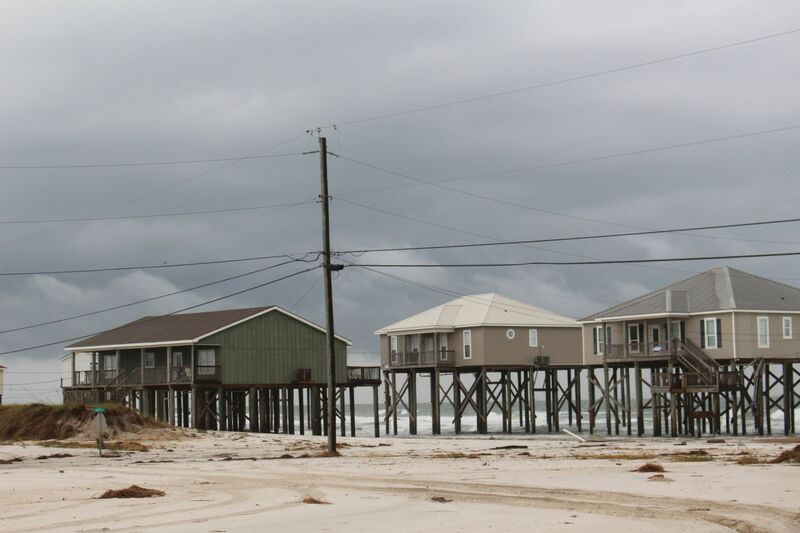 The Dauphin Island Chamber of Commerce, The Town of Dauphin Island, Delta Disaster Services, and many other businesses are contributing to a Hurricane Harvey Disaster Relief Effort. Shipp started as an assistant judge to the late Roy Martin in 1982 and became the head judge when Martin retired in the late ’90s. Shipp, Professor Emeritus of the University of South Alabama’s Marine Sciences Department, will serve as head judge at the weigh station during the 84th rodeo, which is his 35th behind the rodeo scales. Shipp said the other big change he’s experienced during his rodeo time is how marine science has flourished at the rodeo in the last 10 to 15 years. In March, the Corps of Engineers, Mobile District, held an OPEN HOUSE meeting to bring the public up-to-date concerning the status of the Mobile Harbor Widening and Deepening project. (Scroll below to see previous articles and links on this topic). The meeting was an Open House type and was not conducive for good communications between the Corps and those who attended the meeting. 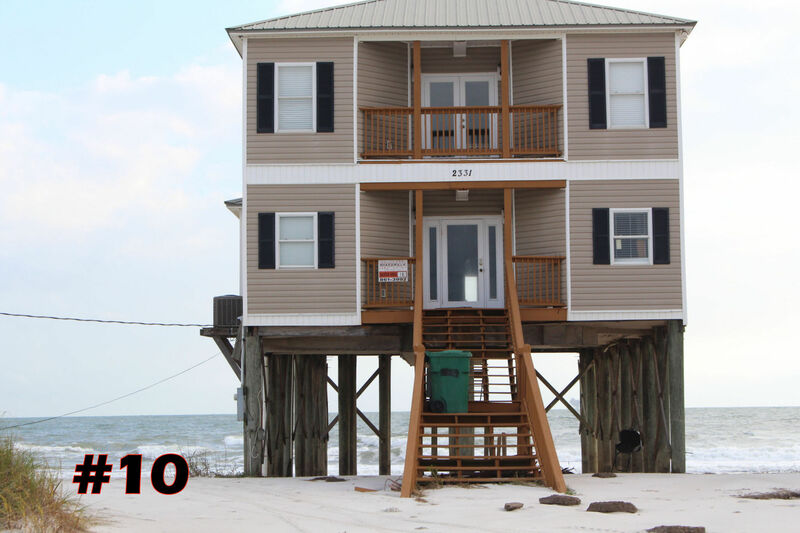 A petition has been set up online by concerned property owners to encourage the Corps of Engineers, Mobile District, to change from this format to a more workable format such as a workshop so all can hear the questions asked and hear the same responses, and to hear the concerns of others and those answers. Only in response to public pressure, the Corps of Engineers has agreed to hold "In-Progress" Public Meetings/Workshops at intervals of about every four months on its Study to deepen and widen the Mobile Harbor Ship Channel. The next "In-Progress" meeting is tentatively scheduled for July 25, 2017. 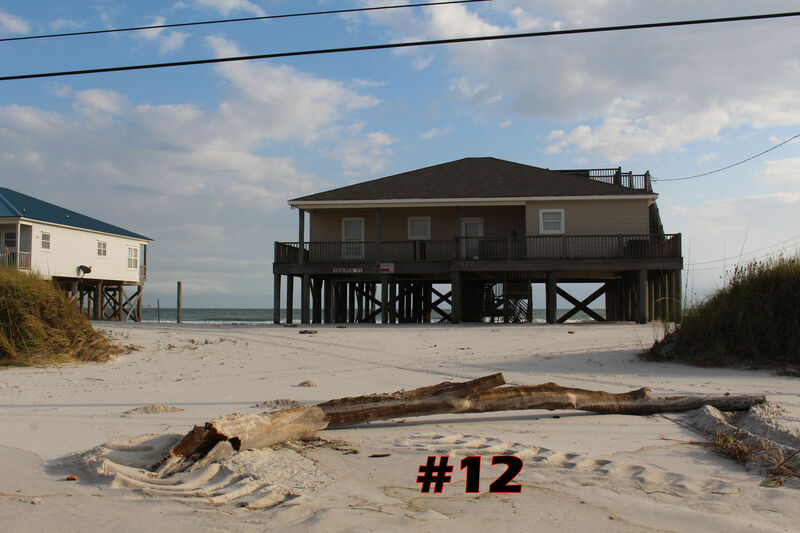 Please click the link below to sign the quick and easy petition and show your support for Dauphin Island’s Shoreline. 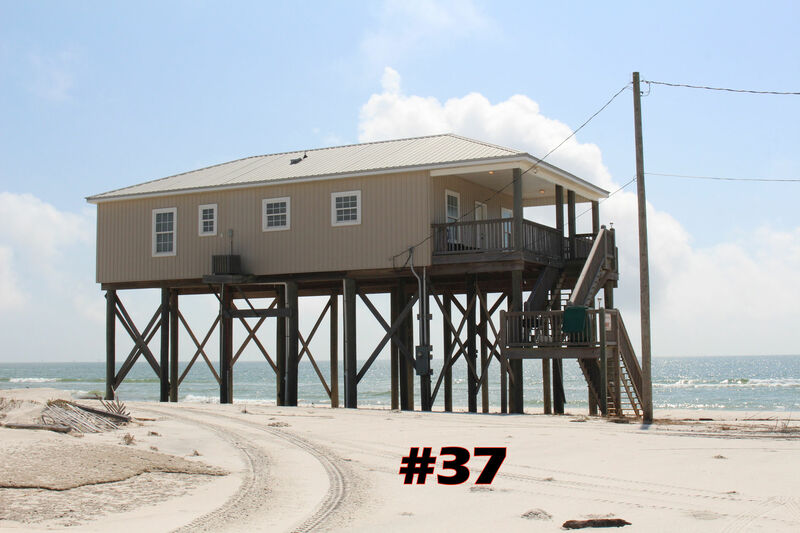 The 59th Annual Dauphin Island Race has been postponed due to weather concerns. Winds Saturday afternoon are forecast to gust as high as 25 mph, causing safety concerns for racers. 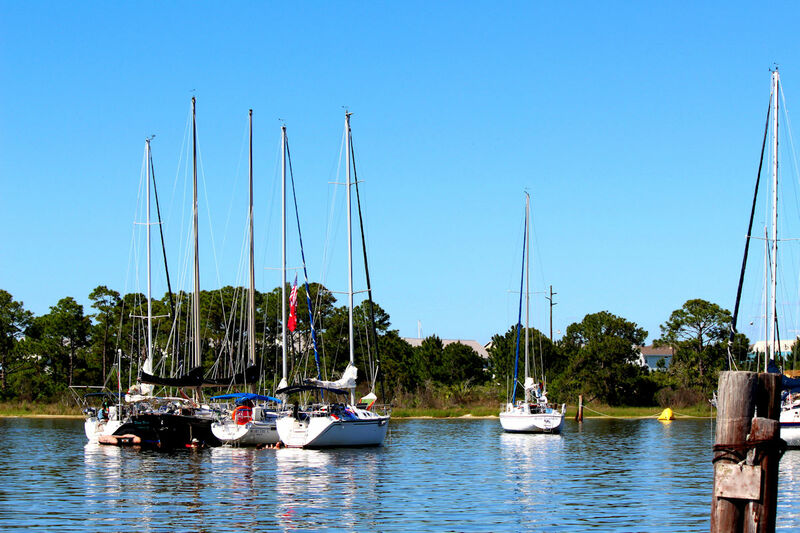 This year's organizer, The Buccaneer Yacht Club has not yet posted a make-up date, but plans to do so soon. To read more at AL.com click here. During May and June of this year our little Island Airport will see some new activity as drone tests will conducted by the Office of Navel Research. 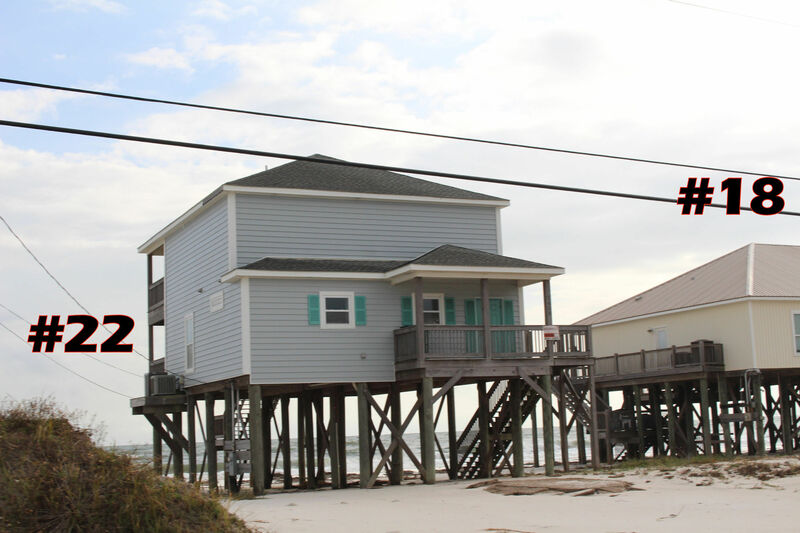 The planned UAS flight path will avoid overflight of populated areas on Dauphin Island, and be conducted in a manner that minimizes noise or other disturbance for Dauphin Island residents. One of the features they plan to evaluate are drone-mounted lasers that can measure water depth from the air. Click here to read the full article from the Navy Times. 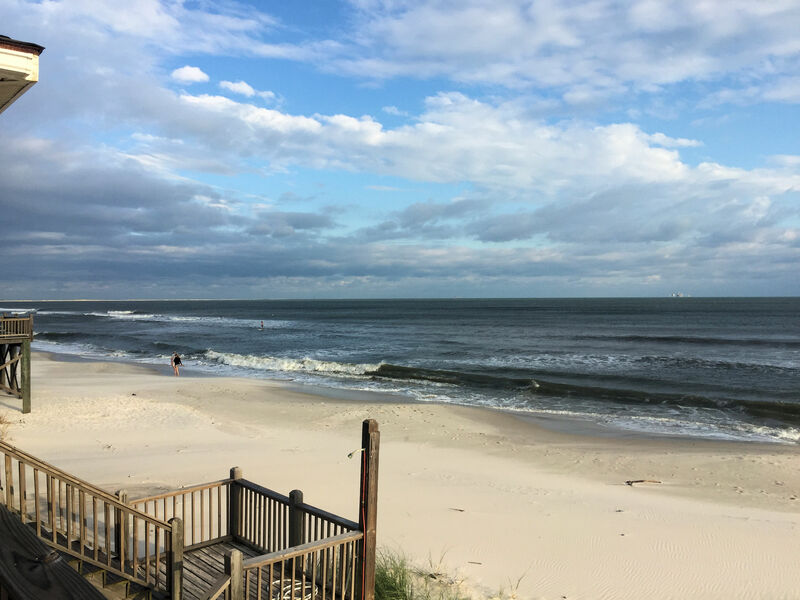 The Town of Dauphin Island is pleased to provide IMPORTANT information about the US Army Corps of Engineers and the Alabama State Port Authority Study to widen and deepen the Mobile Harbor Ship Channel. This Study is expected to be completed within a couple of years. 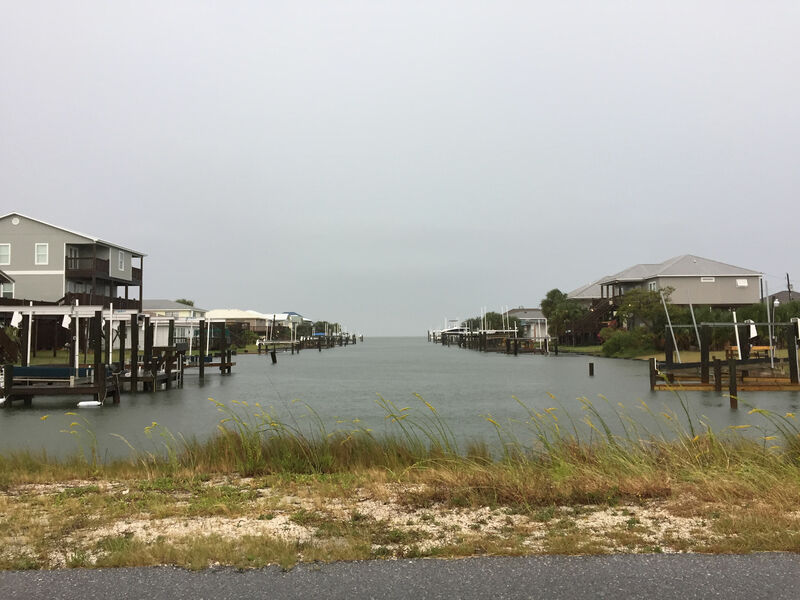 Since the ultimate decision as to how the Ship Channel will be enlarged and maintained in the future will have significant long-term effects on our barrier island community, ALL property owners should stay informed about the Study. 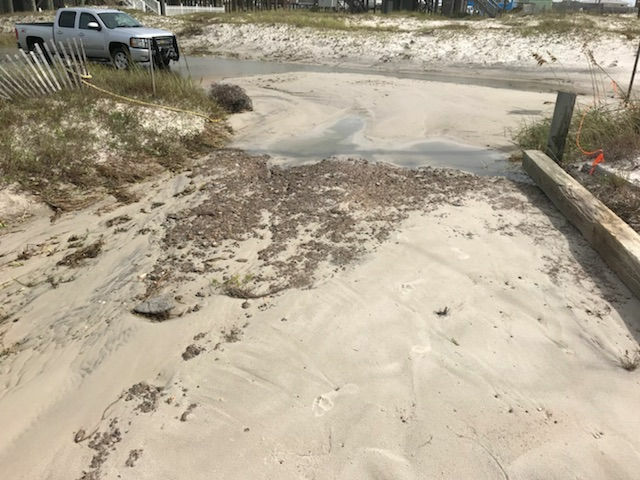 Our goal is to work with the Corps, Port Authority and other agencies to ensure that an improved dredged material disposal practice is incorporated into the project that will require ALL beach quality sand be placed at a location that will truly benefit Dauphin Island while countering our island's significant shoreline erosion problem. - Read the Corps "Biweekly Updates on the study's progress that can be obtained via the following link. Biweekly Updates Click Here. - Sign up and receive the Corps' Study "Quarterly Bulletins", that will be released beginning in February 2017. To receive the "Quarterly Bulletins", please visit the above Study website. 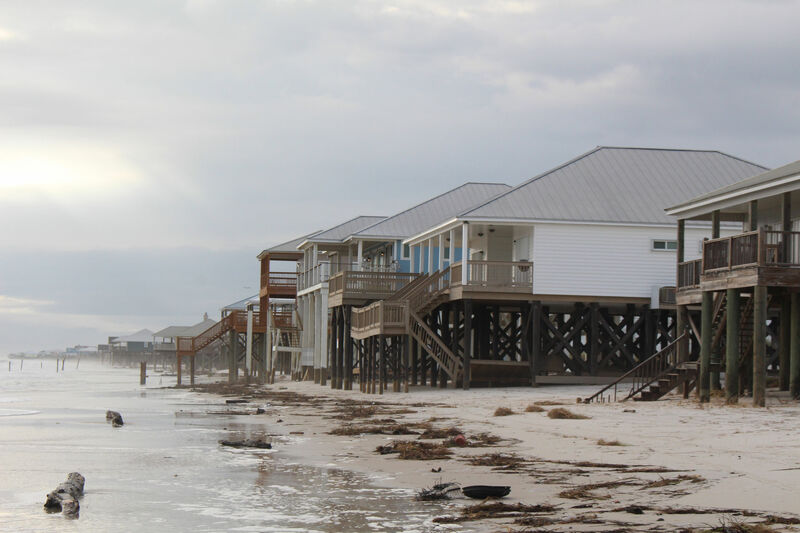 Because of the importance of the Corps Mobile Harbor Study to Dauphin Island, I encourage you to stay abreast of the Study and strongly recommend that you participate whenever possible. 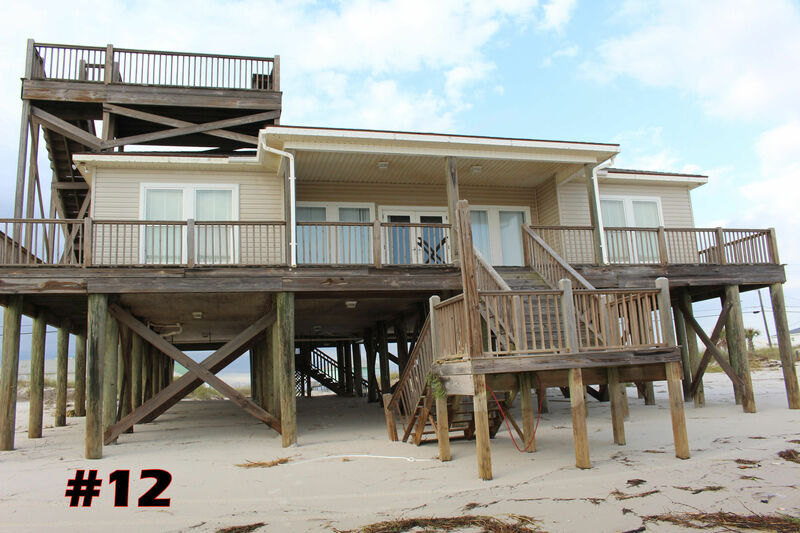 The Corps Study provides a significant OPPORTUNITY for the eroding shorelines of our barrier island community to be restored. The Corps will hold at least three public forums during calendar year 2017. The first workshop is scheduled for March 16th at a time and location to be determined. 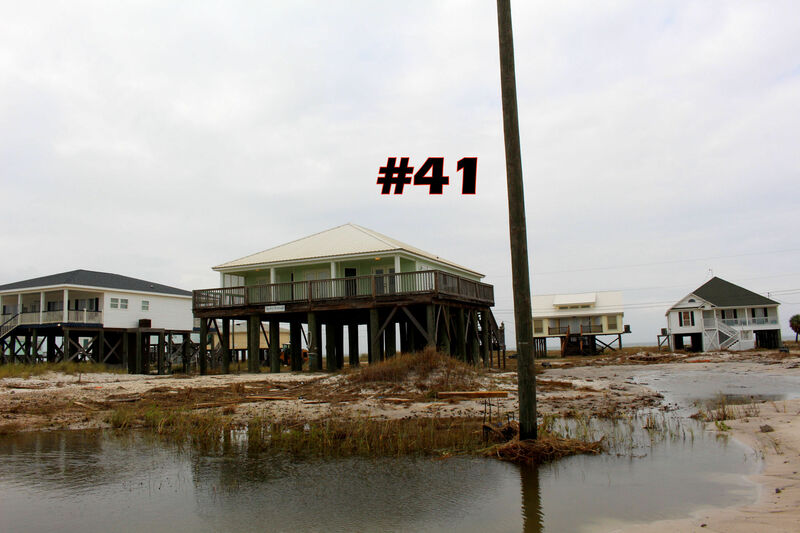 I can not stress enough how important it will be for Dauphin Island's interests to be represented by a large turnout. I hope that each of you will plan to attend the March 16th public workshop and remain engaged throughout this important process. The town will pass along pertinent information about the workshops and the Study as it becomes available from the Corps. An Open House (6pm) and Public Meeting (6:30pm) will be held January 17th at the Shelby Building to receive comments on the proposed Alabama Trustee Implementation Group Draft Restoration Plan I and Environmental Impact Statement. 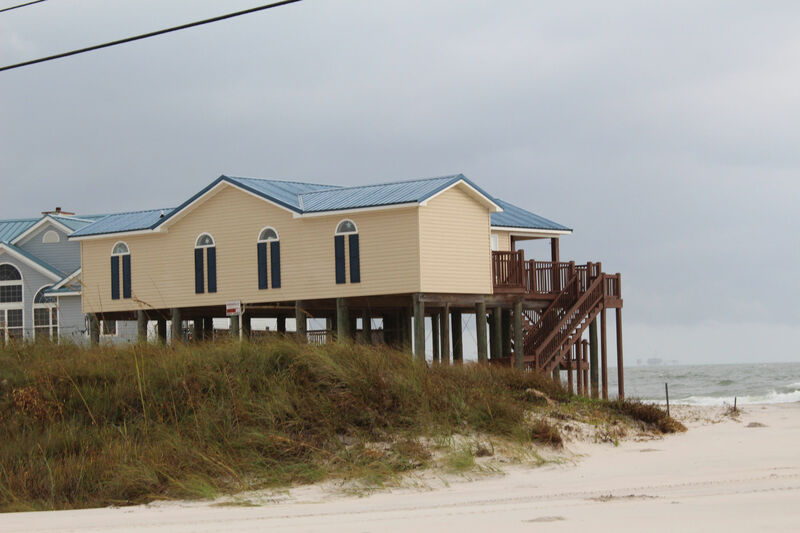 The Plan includes two projects here on Dauphin Island: DI Eco-tourism and Environmental Education Area ($4M) and the Mid-Island Parks and Public Beach Improvements ($1.9M). The meeting will be held on Tuesday, January 17, 2017 at the Shelby Center at DI SeaLab. For more information click here to view the plan. 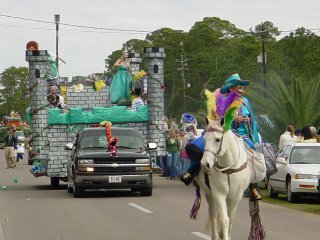 Dauphin Island will once again kick off the Mobile area Mardi Gras Season with the first parade of the year. The Krewe de la Dauphine is set to roll down Bienville Blvd January 28, 2017 at 1pm. The first annual Town of Dauphin Island Parade - "The Peoples Parade" will roll the following Saturday February 4th at 1pm. Our office will be closed for the Christmas Holidays Friday December 23rd and Saturday December 24th. We will re-open Monday December 26th at 9am. Emergency contact numbers are posted on our office door and can be heard by calling our office toll fee 877-861-3992. Merry Christmas & Happy Holidays! The plan to move the historic Little Red Schoolhouse from its current location to the area across from Town Hall is roughly expected to take place Wednesday December 7th. Residences and adjacent neighborhoods between the two areas will experience power and cable TV outages during transport of the building. The move begins at 7am with expected outages from the School grounds to Lackland Street from roughly 7am to noon and outages from Lackland Street to LeMoyne Ave from noon through the afternoon hours. TIMES AND LOCATIONS OF UTILITY DISRUPTION IS SUBJECT TO CHANGE. In addition, traffic along Bienville Blvd will be re-routed at times to expedite the move and ensure safety. DIPD will be on hand to assist traffic flow, please drive carefully and be aware of both workers, officers and pedestrians near work zones. 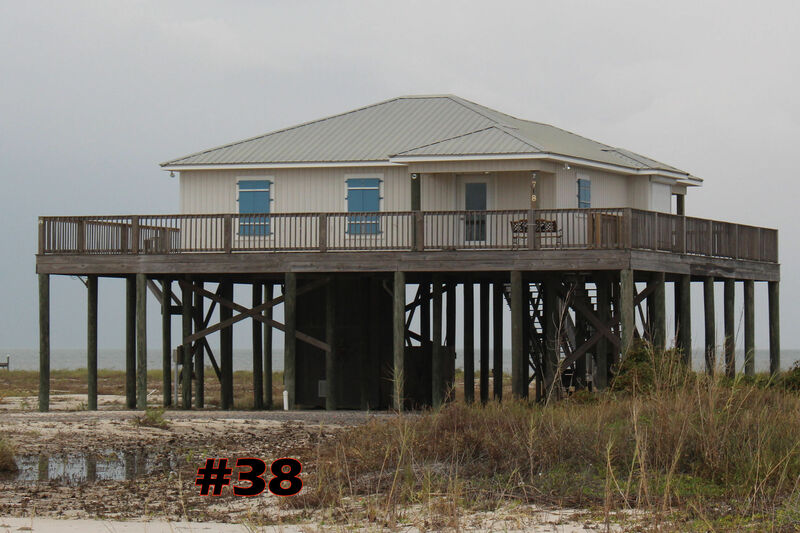 This is to provide you with a brief update regarding the ongoing Mobile Harbor Deepening and Widening General Reevaluation Report (GRR) Study by the Corps of Engineers and to respectfully request you take time to share your thoughts with the Corps regarding this important matter. 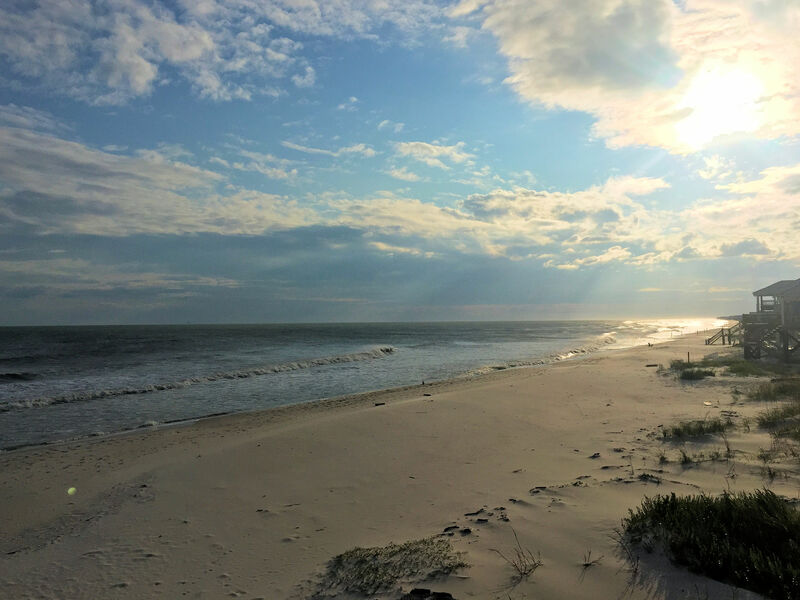 This study will likely determine whether the proposed widening and deepening of the Mobile Ship Channel will receive authorization and it is essential that impacts to Dauphin Island be taken into consideration during this process. 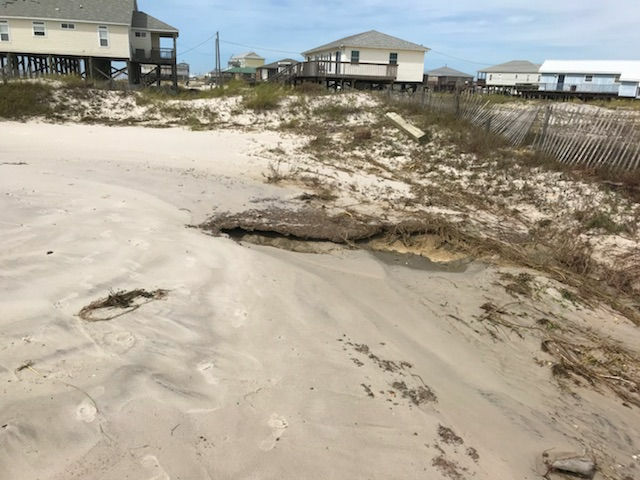 For some time, those of us familiar with Dauphin Island have repeatedly raised concerns over the current dredging and disposal practices associated with the Mobile Harbor Channel. 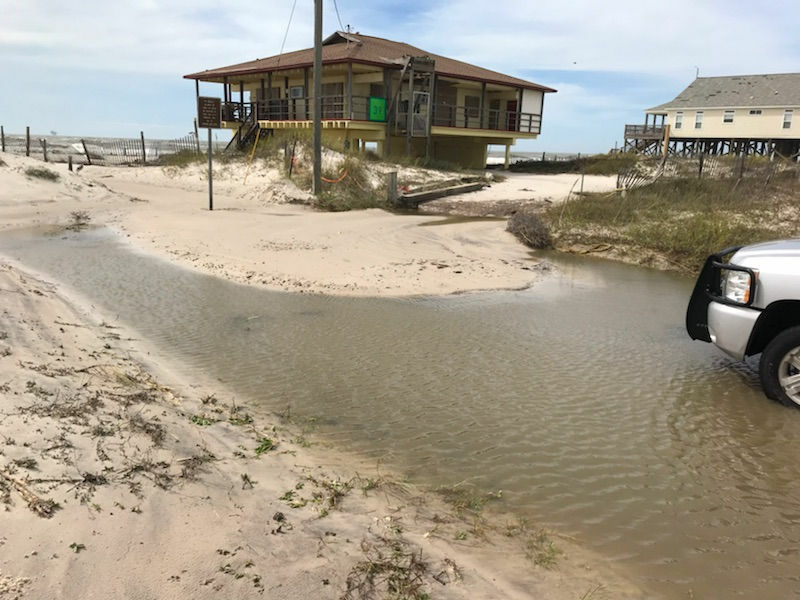 We feel strongly that alternative disposal locations in closer proximity to the island would directly benefit shoreline growth while creating a more sustainable barrier island for generations to come. This message has been shared with Corps representatives and numerous elected officials over the years and we remain hopeful an improved maintenance disposal practice can be put in place with either the existing channel and/or the proposed project currently being considered via the study. As you know, the history surrounding the Mobile Ship Channel is a lengthy one. 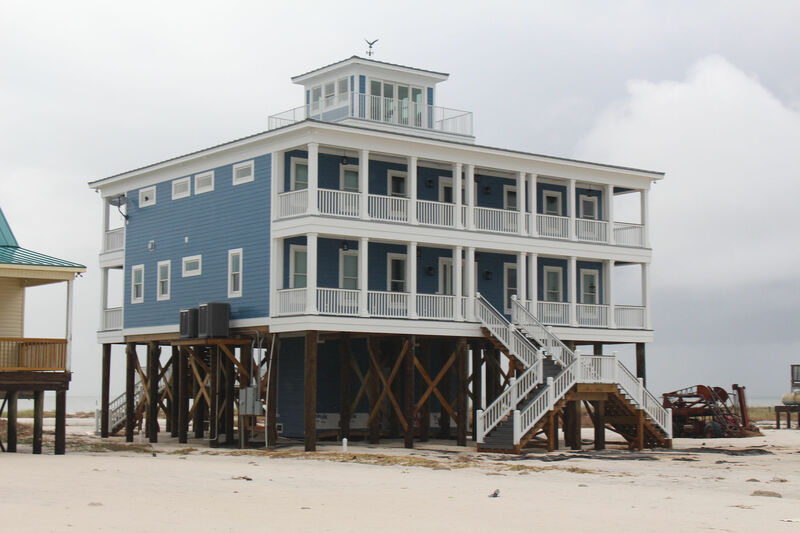 However, it is in the island's best interest that we continue to search for ways to support the regional economic benefits provided by the Port of Mobile while at the same time protecting our barrier island community. 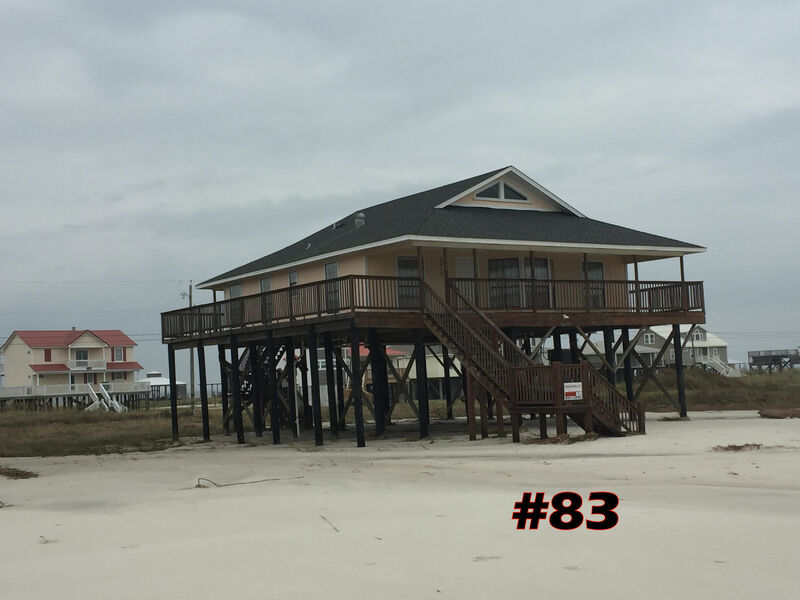 This could include re-establishing a Citizen Advisory Committee, addressing historical sand losses related to channel dredging and disposal practices, and increasing public awareness and participation through additional meetings/public hearings and more. Feel free to incorporate some of my points as you develop your own letter. Thank you in advance for your cooperation and support. 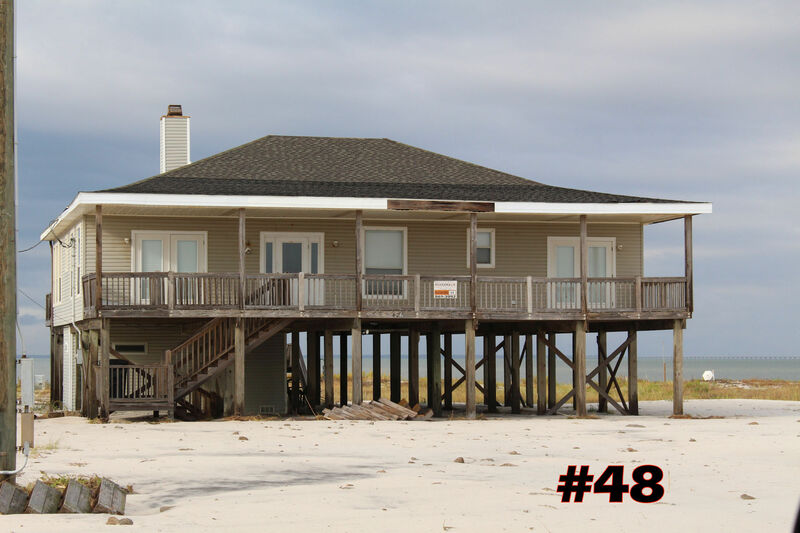 The Boardwalk Realty office will be closed Thanksgiving Day. We will re-open Friday. Happy Thanksgiving to all! 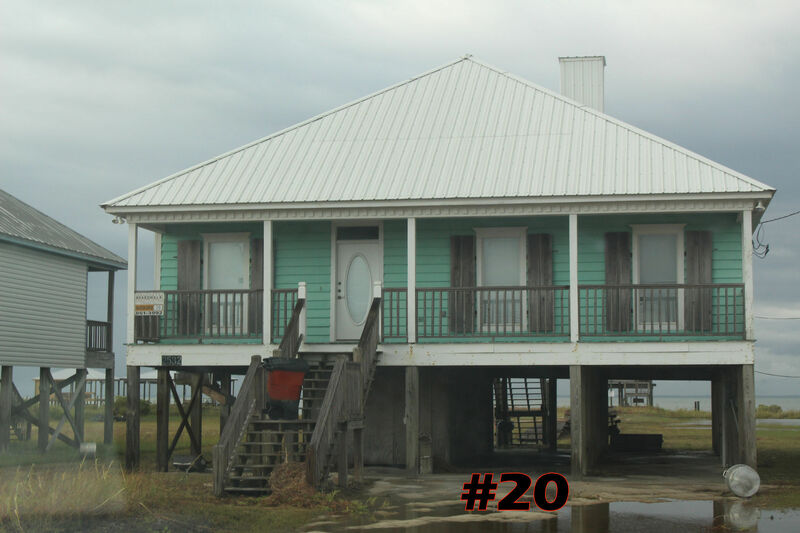 The building known in the town of Dauphin Island as the Little Red School House will soon get a new home and a new purpose. The historic building -- more than 80 years old -- will be moved to a new location near Town Hall, where it will serve as a multipurpose center. Click here to see the full story on FOX10TV. 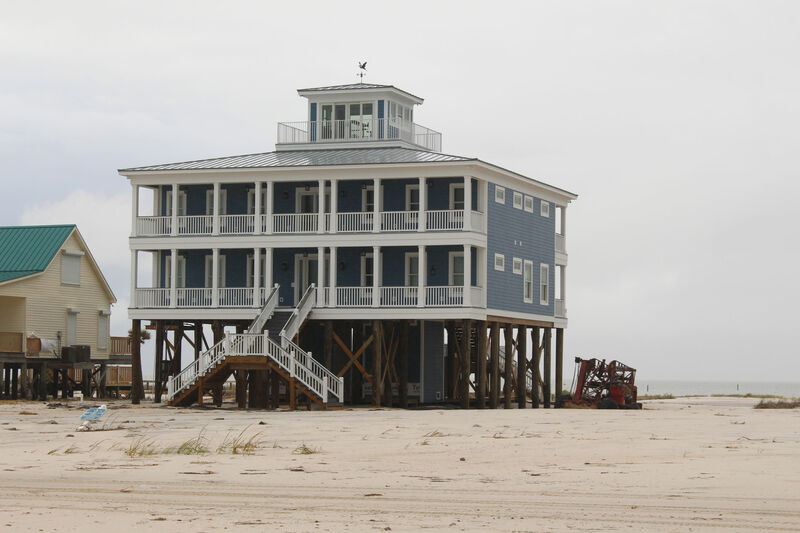 Dauphin Island conservation acquisition, $3.5 million. 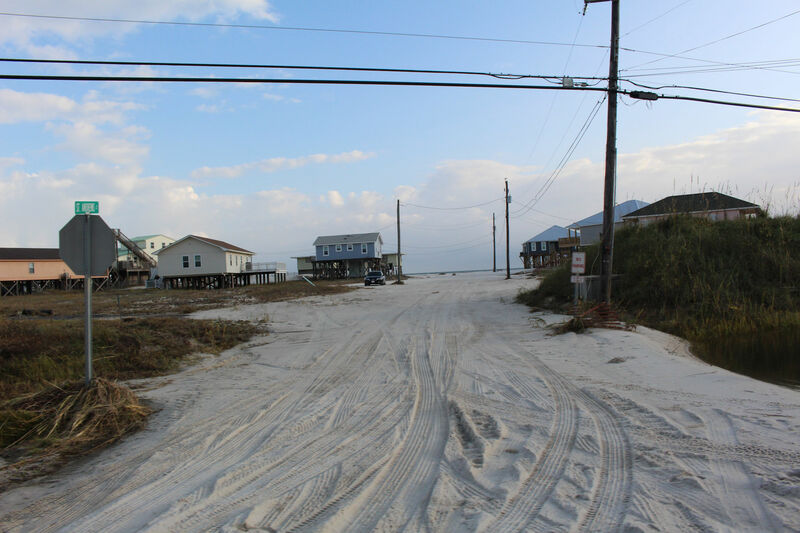 The project includes the acquisition of about eight acres of remaining undeveloped beachfront on mid-Dauphin Island, and will include the construction of fencing and a dune walkover. Land is adjacent to Pirates Cove. Click here to read the full article in The Lagniappe. 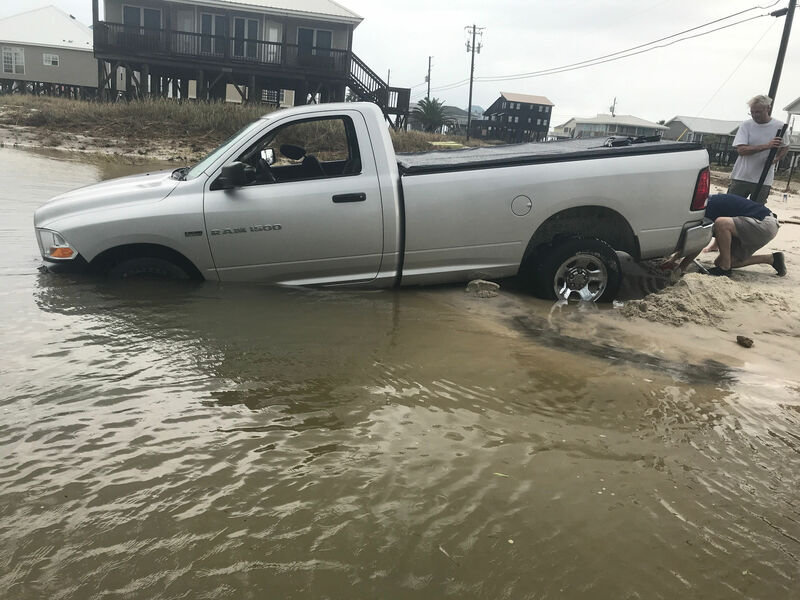 The Coast Guard rescued three men and two dogs from a sinking vessel near Dauphin Island, Wednesday, October 12. 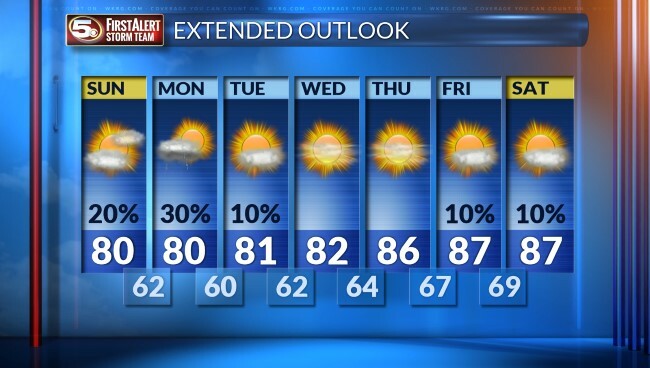 Click here for all the details from FOX 10TV. 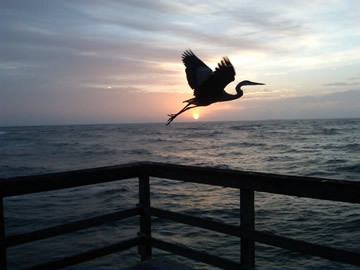 Visitors to Dauphin Island near the end of October were treated to a beautiful glowing sight in the surf. Tiny phytoplankton, known as Noctiluca Scintillans, which roughly translates to night-shining sparkle- In the millions, they create bioluminescence. View the full article here at WKRG TV. 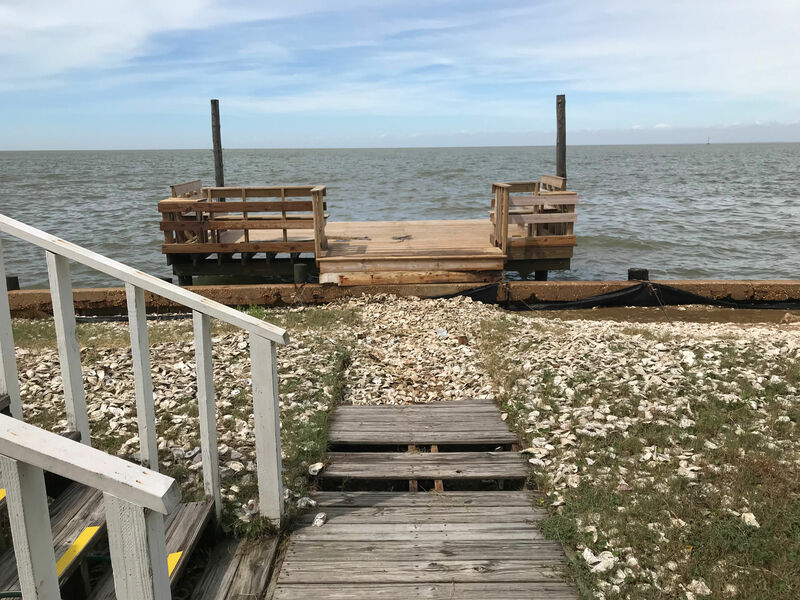 Alabama Power Company and the Marine Resources Division of the Alabama Dept of Conservation are working together to create a new fishing reef 25 miles south of Dauphin Island. 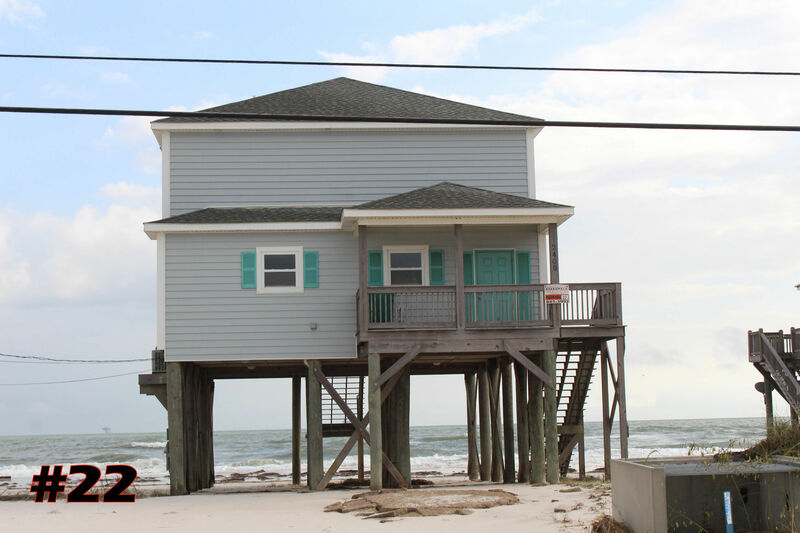 Click here to view the full article at Alabama News Center. 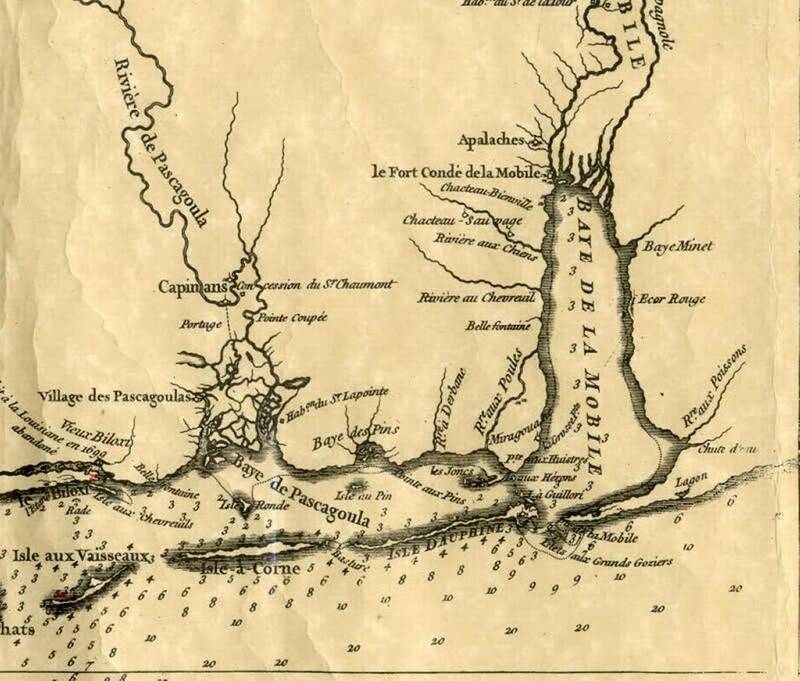 In 1711 Pirates stormed Mobile Bay and attacked Dauphin Island, later dubbed "Massacre Island" by Pierre LeMoyne after the discovery of a huge pile of human skeletons. Come and see the Pirates as they pilfer, pillage and fight against Spanish & British Galleons. Witness Flintlock Pistol Duels, Pirate Tug-O-War, Swashbuckling Sword Play, cannon firings, Blacksmith demonstrations and period music by the Kracker Dan Band. Treasure hunt for kids 12 and under. Tickets are $8 age 13 & over, $4 age 5-12 and FREE for the little swashbucklers ages 4 and under. For more information visit fortgaines@outlook.com. 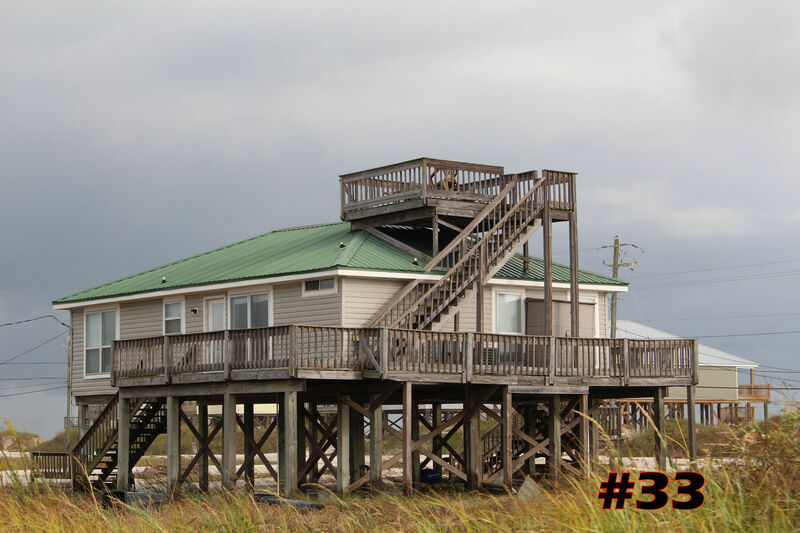 Did you know that the Food and Drug Administration's only marine research laboratory is located on Dauphin Island? Click here to learn about the valuable discoveries the scientists here on the Island are making while working with samples from all around the US and other countries. The Dauphin Island Sea Lab has put a bounty out for a new invasive species in the Gulf - the Asian Tiger Shrimp. To help the Sea Lab study the species, they are offering fishermen and shrimpers $30 per Asian Tiger Shrimp brought to the Sea Lab for study. Click here to learn more about the hunt for the Asian Tiger Shrimp. 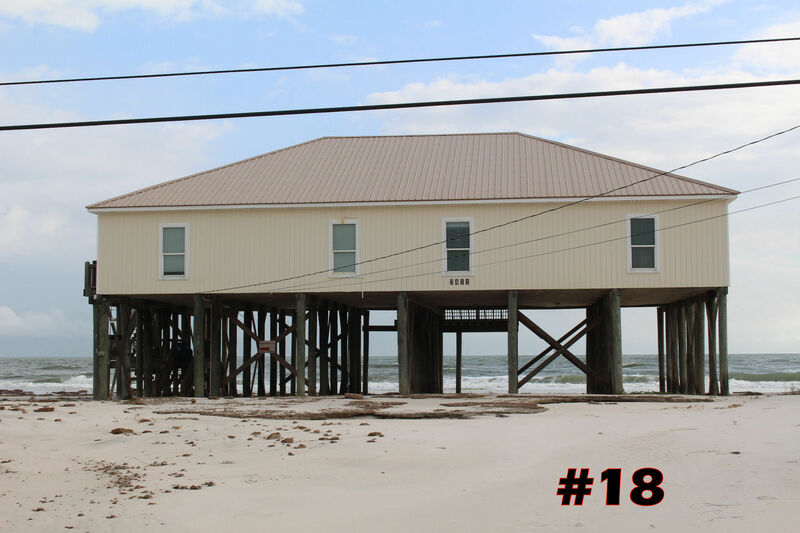 Read all about the plans for Dauphin Island's first triathlon to be held October 15th. 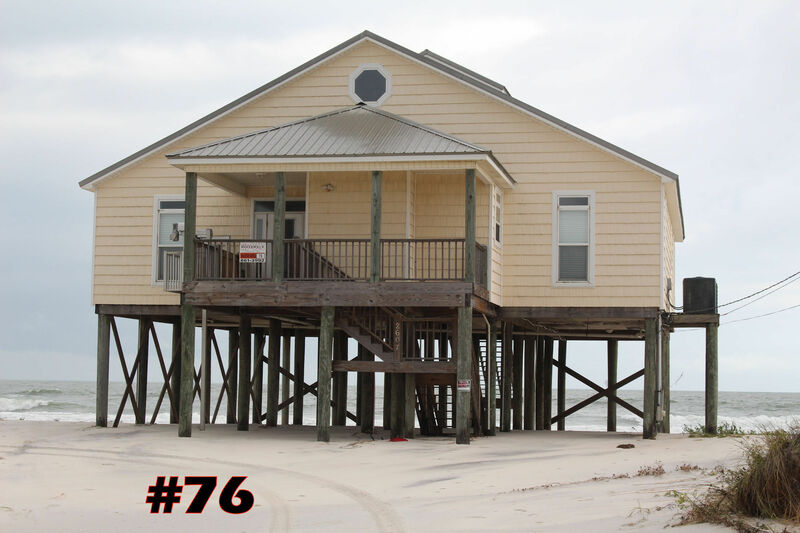 The race will take racers into Gulf waters then biking the Dauphin Island Bridge and running the Isle Dauphine Golf Course, Island streets and the bicycle/jogging trail. Read all about it here at Al.com Expect traffic delays the morning of October 15th. The Town will be hosting a fireworks show on Sunday Sept 4th at 8:30pm. Fireworks will launch from the public beach located next to DI Elementary School. 1. There is a public hearing scheduled for Wednesday, March 23, 2016 at 3:00 p.m. at the Alabama State House Building (Room 328) in Montgomery regarding HB236. Attendance at this hearing is encouraged. 3. SIGN THE PETITION Click HERE to sign .It will be delivered to the Committee Members at the Public Hearing on March 23. Please send the link to others as well! 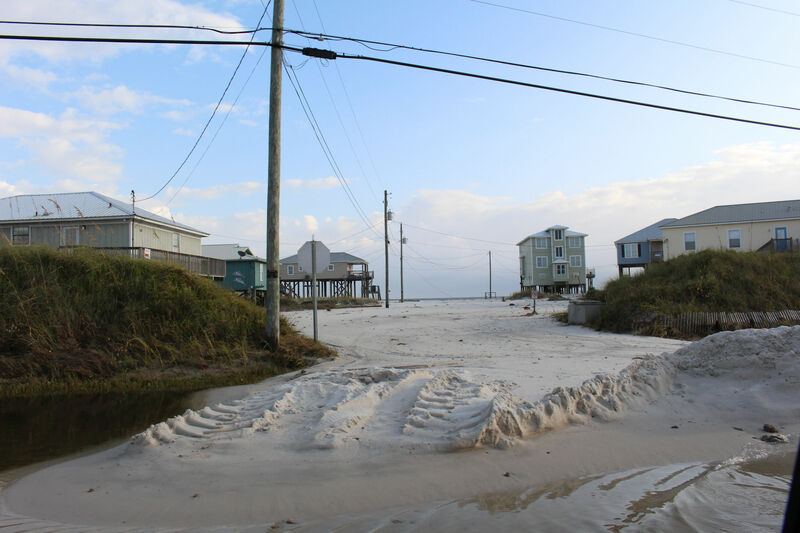 All four of our neighboring Gulf Coast States have enacted similar laws to protect their beaches from erosion caused by dredging channels through their coastal inlets. Only Alabama lacks such a law. 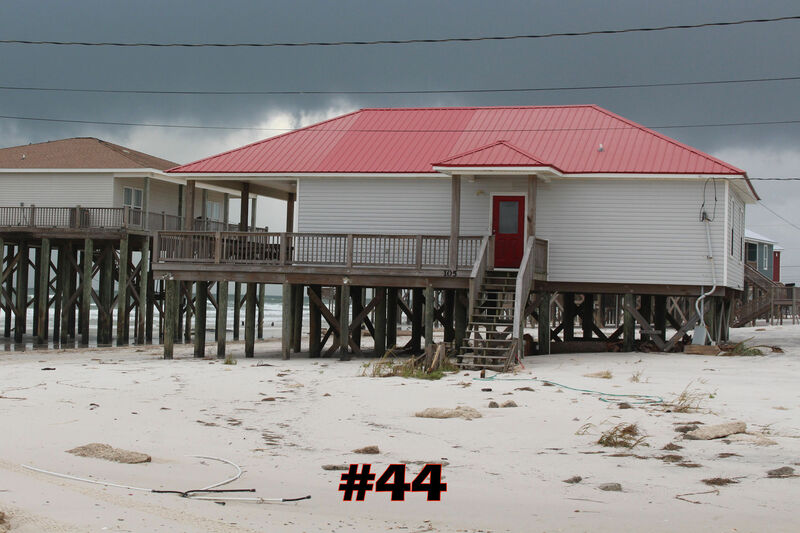 Please send a letter of support for the bill to help protect Dauphin Island. A notebook is being prepared to document all support letters for this bill so they can be shared with State Legislators at future hearings on the bill. So that your letter can be included, please email a copy to: coffeegl@aol.com. THANKS!!!!!!!!! And, please send your letters now! The U.S. Army Corps of Engineers and the Alabama State Port Authority have been working since 2009 to incrementally enlarge portions of the Mobile Harbor. Eventually the ship channel could be deepened an additional 10 feet and widened another 150 feet. 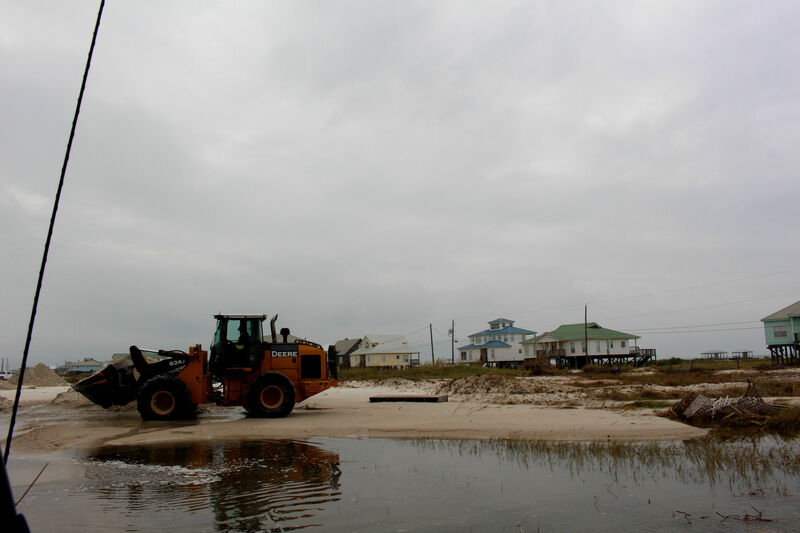 To maintain a deeper and wider channel, larger volumes of sands will likely be dredged from the Outer Bar Channel east of Dauphin Island. 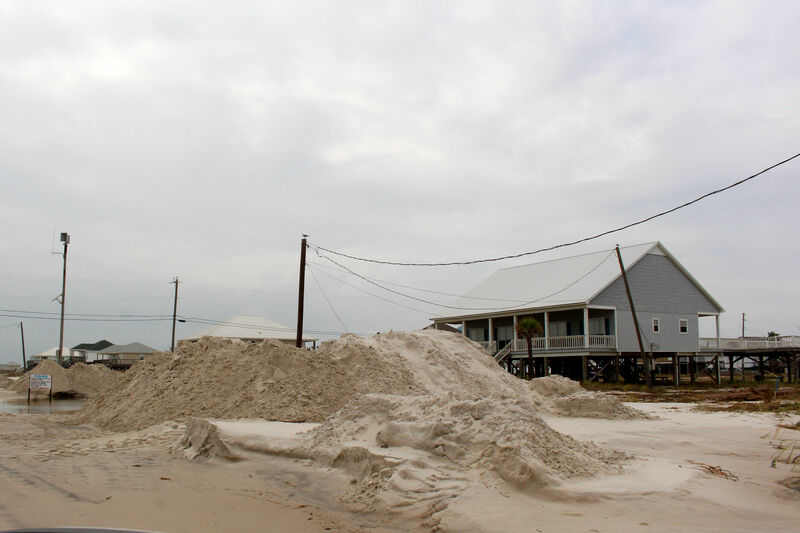 Where the Corps decides to place the dredged sands will further influence Dauphin Island's erosion problem and influence flooding difficulties along the entire southern shore of the island. The Mobile District is required by Federal regulations to issue Public Notices to solicit public comments on Federal Civil Works projects. The meeting will be held January 12, 2016, at the Mobile Alabama Cruise Terminal, 201 S. Water Street, Mobile, Alabama 36602 from 5:00 to 8:00pm. The purpose of the meeting is for the public to identify concerns and impacts associated with the channel enlargement project that should be addressed in the EIS. If you are unable to attend the meeting, the Public Notice also provides directions on how to mail your comments and concerns. The DIPOA Board of Directors strongly urges you to take advantage of this opportunity to make your concerns known to the Corps by attending the January 12 meeting or mailing your comments. 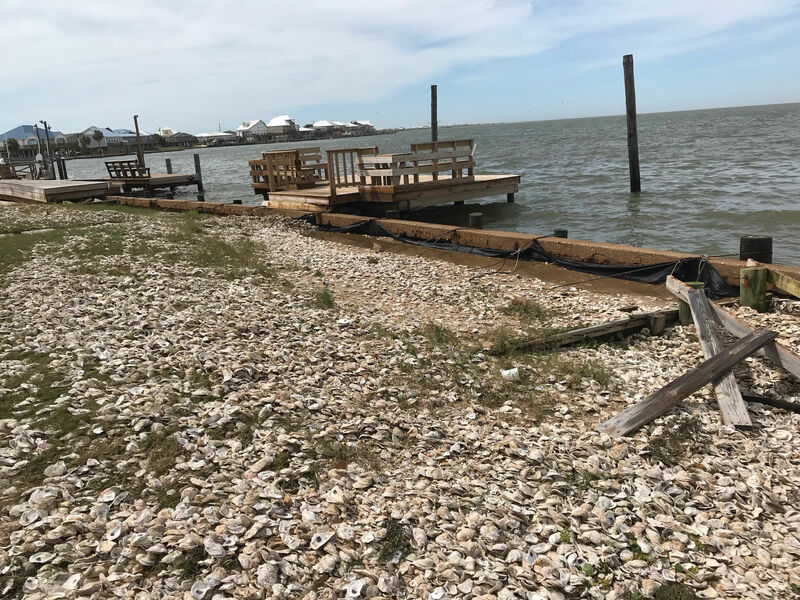 By now, it's no secret that many coastal residents aren't happy with the proposed settlement between BP, the federal government, and the five Gulf Coast states. They have until December 4th to make their thoughts known to the U.S. Department of Justice before the consent decree is finalized. Click here to read the full al.com article by Cameron Smith. The Isle Dauphin Golf Course is open for business and Snowbird Memberships are now available. Snowbird memberships include unlimited Greens Fees good January - March 2016. Single membership $100/per month, Couple membership $150/per month with cart fee $10 for 9 holes and $15 for 18 holes. Call Dale Snellman to sign up today at 251-533-0398. 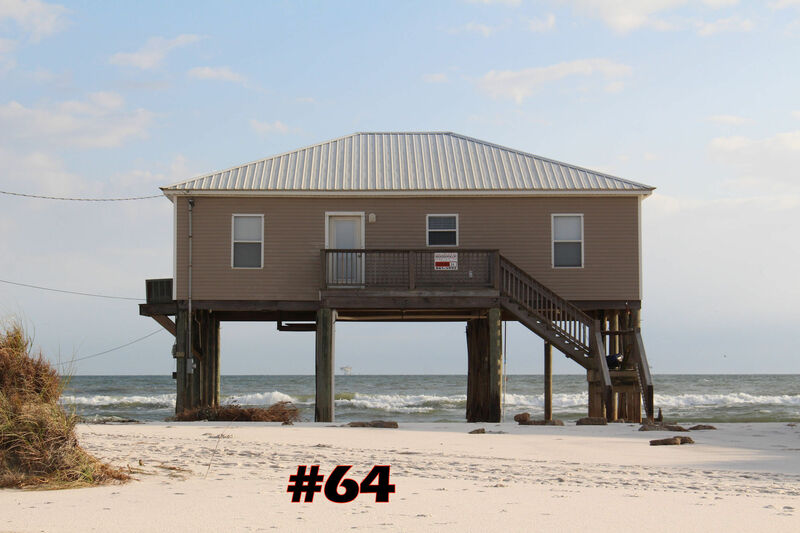 Here are the details on 6 fun activities taking place this weekend in Dauphin Island and Mobile Visit life size Dinosaurs, run the Sunset Bridge 5K, meet reen-actors at historic Ft Gaines and more. Our office will be closed on Fat Tuesday, Mardi Gras Day, February 17 2015. We will re-open on Wednesday February 18 at 9am.